Photos are copyright ©Ray Smith, all rights reserved, and may not be reproduced without express written permission. Photos are protected by DigiMarc ® Digital Watermarks and will be detected on your web site if copied illegally. See http://www.digimarc.com for details on how the Digimarc MarcSpider ® image tracking technology works. On November 9, 2000, we departed LAX airport for a 12 1/2 hour nonstop flight to Malpensa airport near Milan on an Alitalia MD-11 combo. 12 and 1/2 hours in a coach seat is excruciatingly uncomfortable and it was helpful to periodically glance at the GPS display on the Alitalia MD-11 bulkhead in order to determine how much longer the flight would last. We arrived at Malpensa on November 10th at 12:30PM local time and immediately proceeded through customs and passport control. We picked up our rental car (a Mercedes Benz A160, a model I had never seen) at the Hertz Number One Gold counter and began the drive to Florence (Firenze), some 186 miles away. The route was fairly simple. 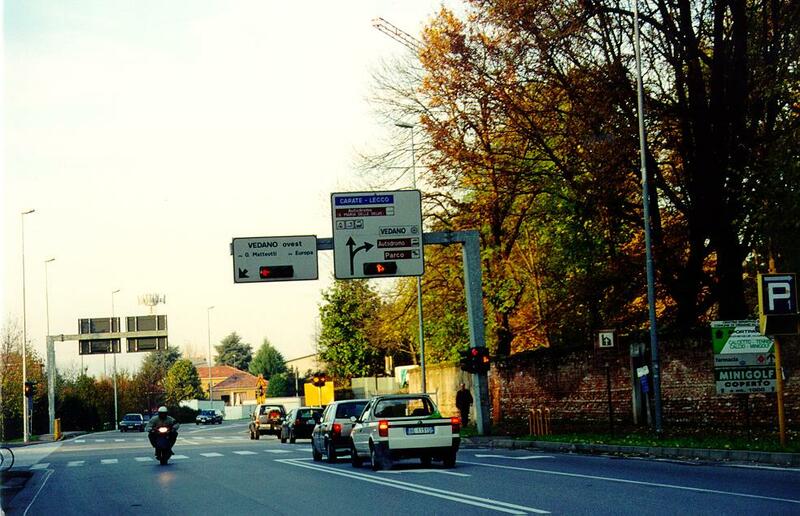 Leaving Malpensa we navigated to the A8 Autostrada and headed east toward Milano (Milan). 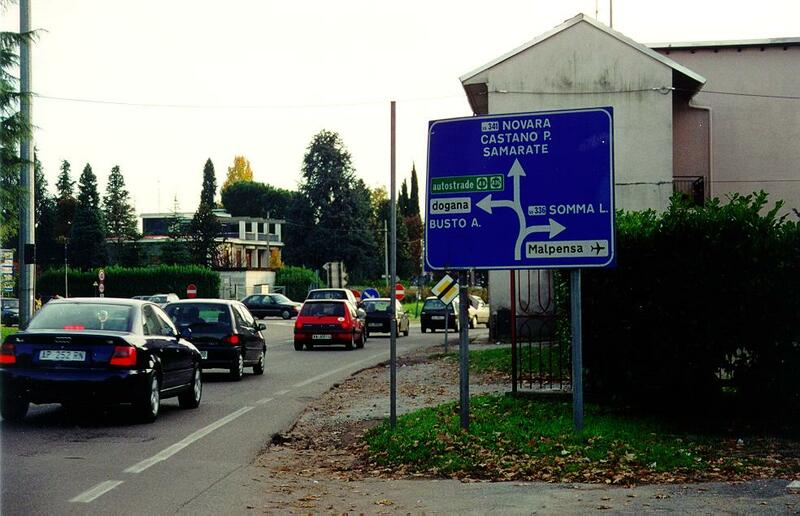 Here the A8 intersects with the A1 Autostrada which heads east south east towards Modena and Bologna. 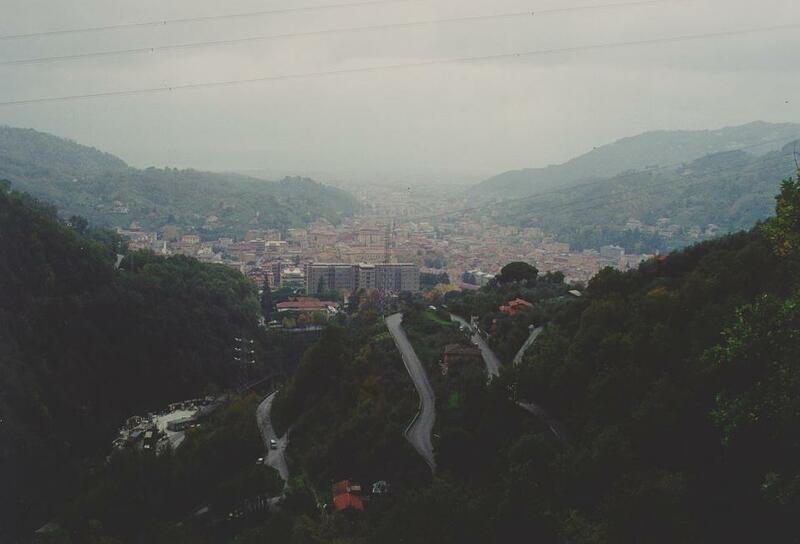 At Bologna we took the A1 Autostrada south and headed through the mountains towards Firenze (Florence). The Autostrada are toll roads but the toll is relatively insignificant (the exchange rate during our trip was 2,250 Lira to one US Dollar) and the roads themselves are excellent. 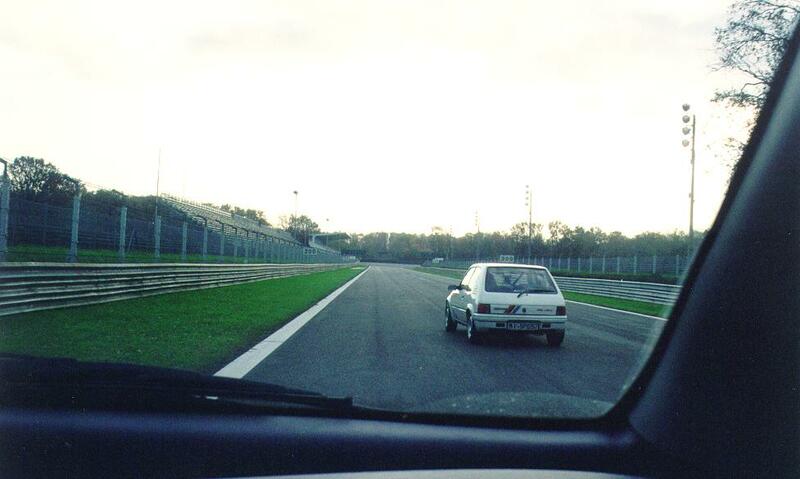 Italians are, for the most part, excellent drivers on the Autostrada, being quite aware of traffic behind them. They willingly yield the left (fast) lane to faster traffic. 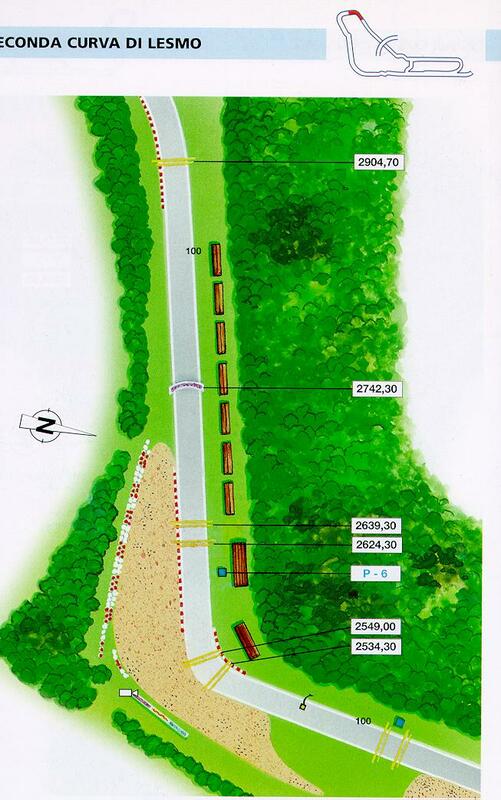 While there is a posted speed limit of about 70MPH (110KMH) traffic moves much faster. I routinely drove at 100 to 120MPH and never saw a police car. 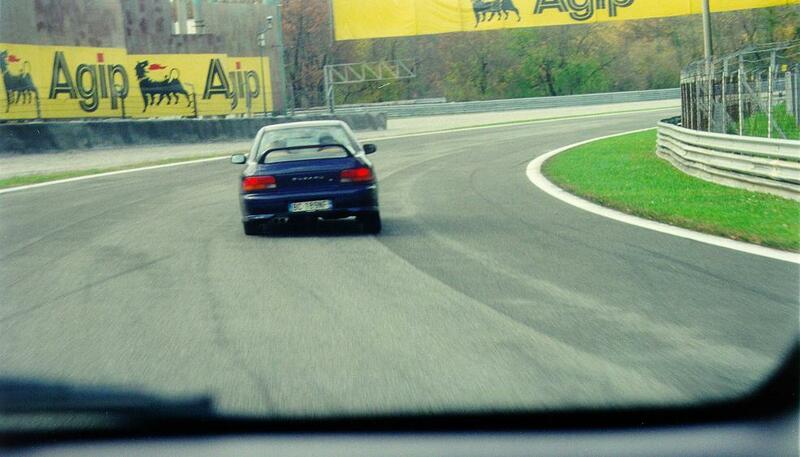 I was passed several times by cars (including a new red Ferrari 360 Modena) going much faster than I was going. 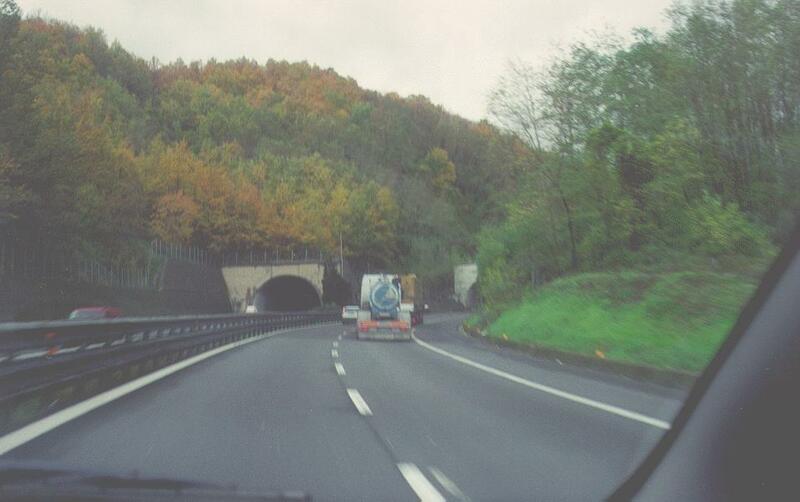 On many stretches of autostrada you will encounter numerous curving tunnels. They are well lighted, which is a good thing because no one slows down at all when driving through them. It is an adventure. It required about 2 1/2 hours to drive from Malpensa to Florence and we immediately checked in to the Sheraton Firenze on the outskirts of Florence, about a block from the Autostrada exit for Firenze Sud. I picked a worldwide chain hotel figuring it would be less of a cultural shock when we first arrived to stay in familiar settings with known services. It was a good plan, but this hotel had seen better days. The service was not very good and the rather long distance from the hotel required taking their shuttle bus to and from downtown Firenze. Their schedules and pick-up points were much less than ideal. 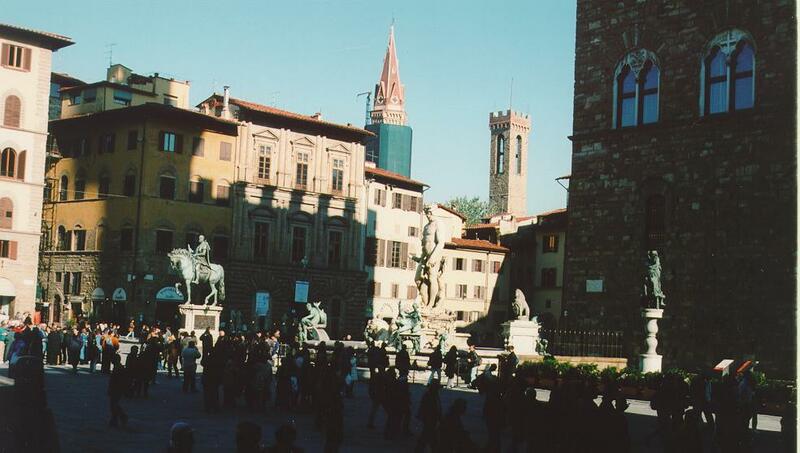 However, the next day we sallied forth to educate ourselves and enjoy the sights of Firenze as well as the food. We were not disappointed. 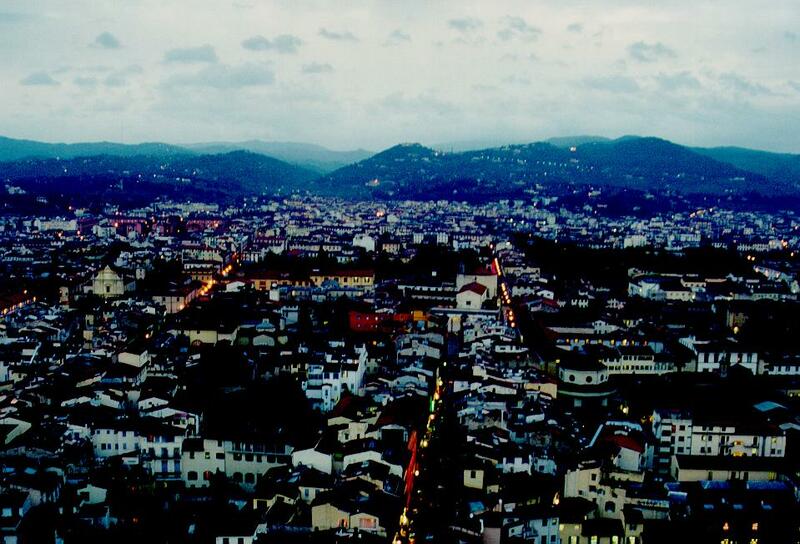 Firenze reminds me a lot of San Francisco. 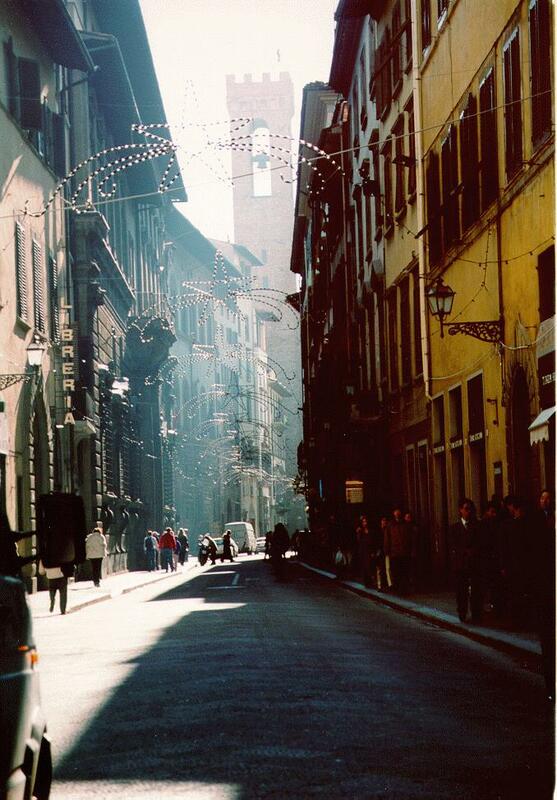 It is a city where walking around is not only fun, but easy since everything is relatively close by. We spent a total of 10 days in Italy and never met a grouchy person, nor did we ever have a meal that was less than superb. Italians are some of the friendliest people I have ever met and they have a remarkable sense of humor. If you make even the lamest attempt to speak Italian, you will receive abundant assistance everywhere you travel. 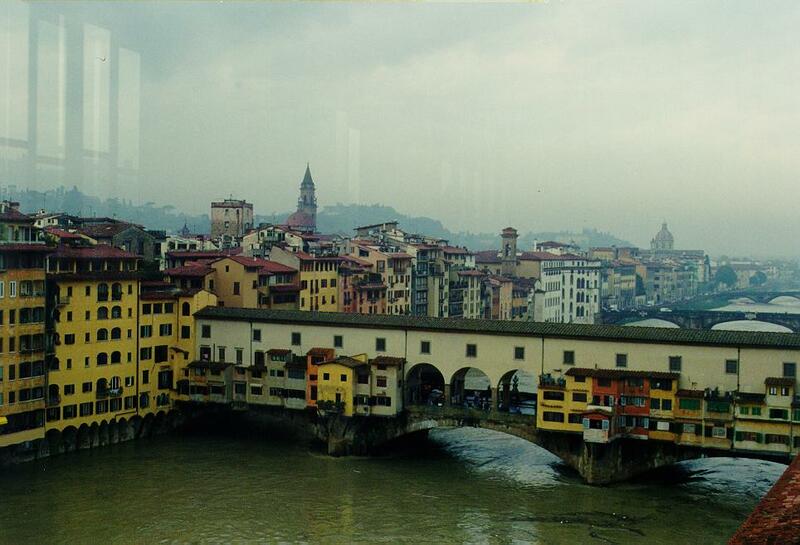 Our first stop, because that's where the shuttle bus dropped us, was the famous Ponte Vecchio. 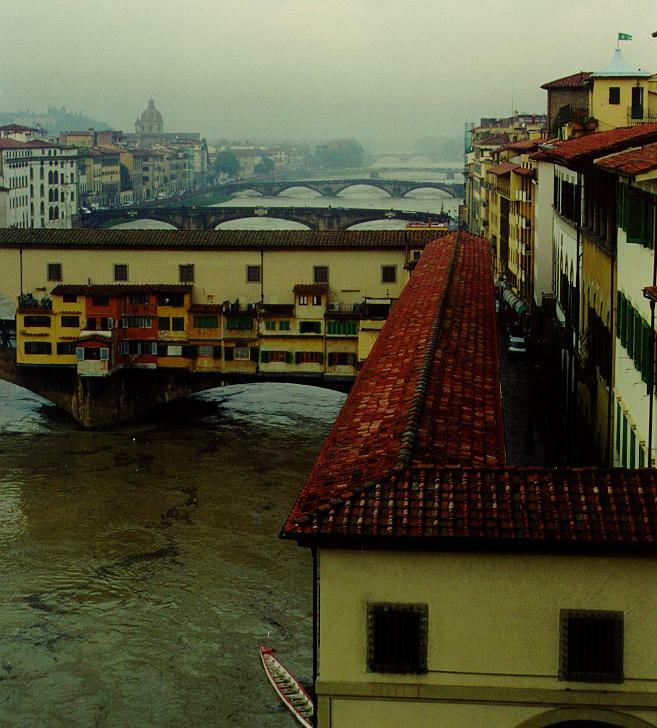 "Ponte" means bridge, and "vecchio" means old. The bridge is lined with shops, most of which sell gold jewelry, and depending on the exchange rate and the time of year (this was November, definitely the off-season so prices were very good) you can get some genuine bargains. You can also pay much too much if you're not careful. On top of the bridge runs the Vasari Corridor which was built by the Medici family so they could walk from the Palozzo Vecchio (old palace) across the Arno to Pitti Palace (Palazzo Pitti) without rubbing elbows with the hoi palloi. 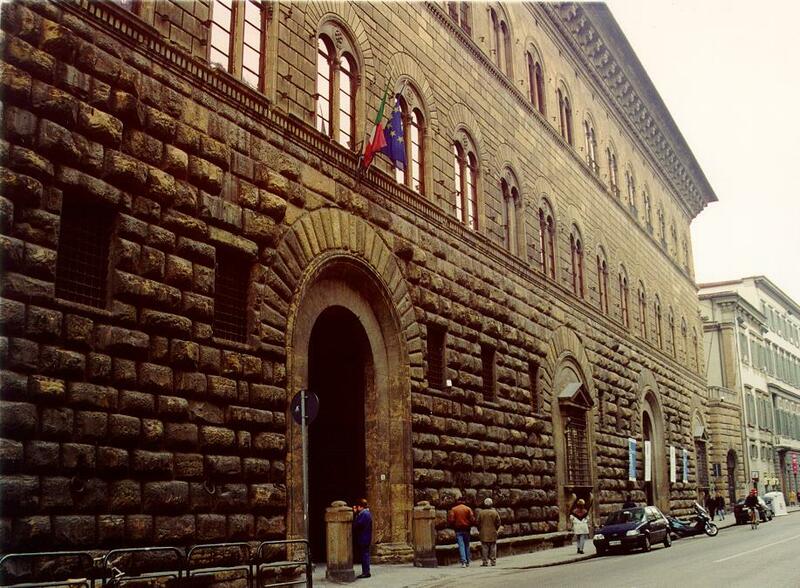 It is now part of the Uffizi Gallery and is lined with art works but is closed to the general public. We headed across the bridge and into the city to reach the Palazzo Vecchio and Loggia dei Lanzi in Piazza della Signoria. Here are some truly great works of art. 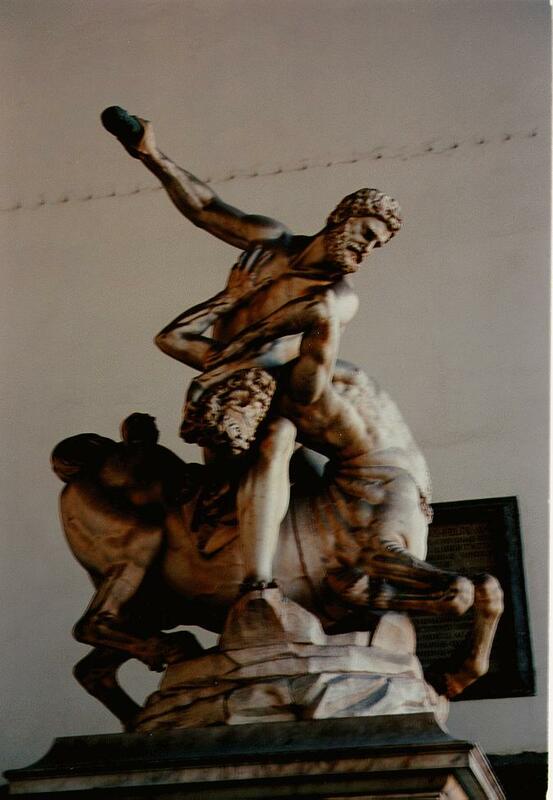 Some are copies, such as Perseus (bronze, by Cellini), and Michelangelo's David, while others are originals, such as the Sabine Women, by Giovanni De Bologna (1583). Unfortunately, leaving these works of art out in the elements has deliterious effects. 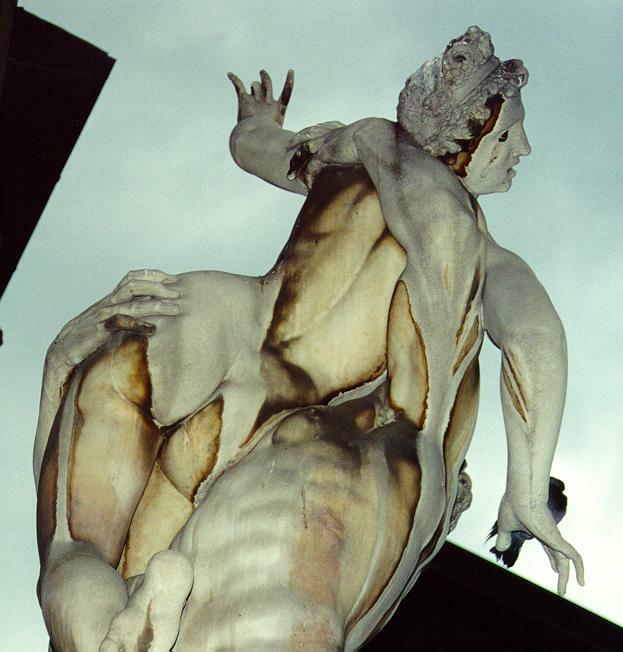 You can see the patina of pollution on the Carrara marble of the Sabine Women. 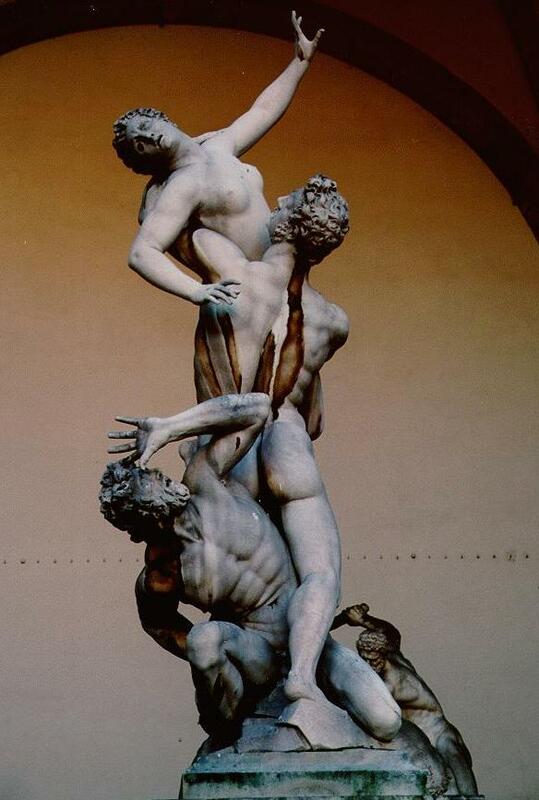 This is one of my favorite Italian High Renaissance works of art. That this was carved with a chisel from marble is astounding when you look at the level of realism in the work, such as the fingers pressing into the thigh of the woman and showing the indentations. 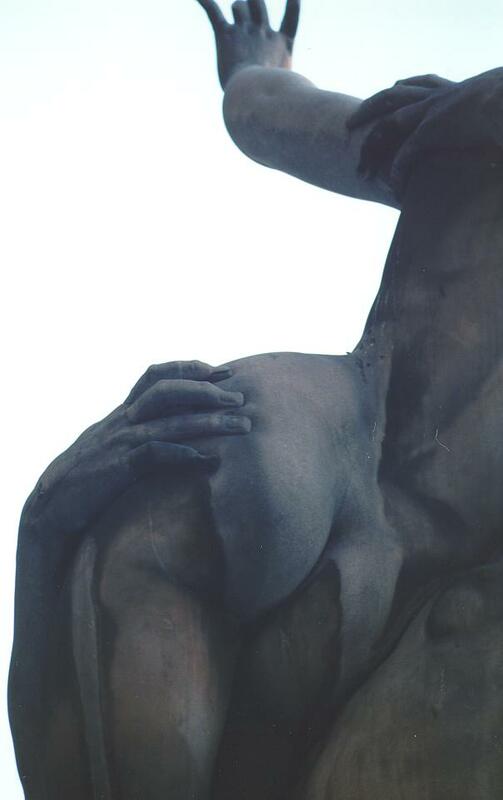 Here is another closeup of the detail of Sabine Women. 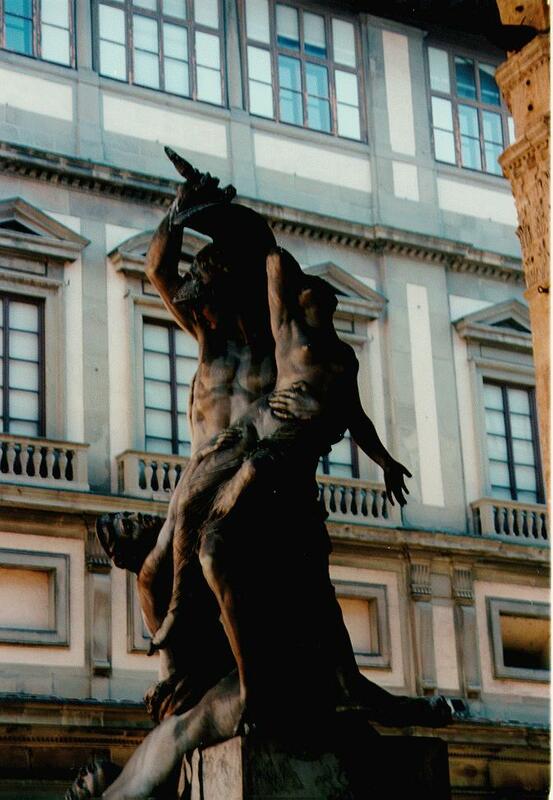 Also in the Loggia dei Lanzi are Hercules and the Centaur, by Giovanni De Bologna, and Polyxena by Pio Fedi (1866). 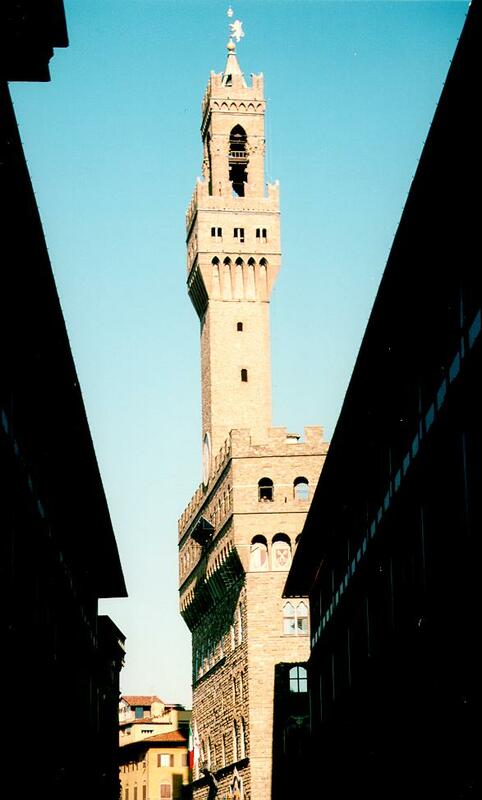 The old buildings, such as the Campanile at Palazzo Vecchio are in remarkably good condition and are in fact used daily. The stonework is exquisite. 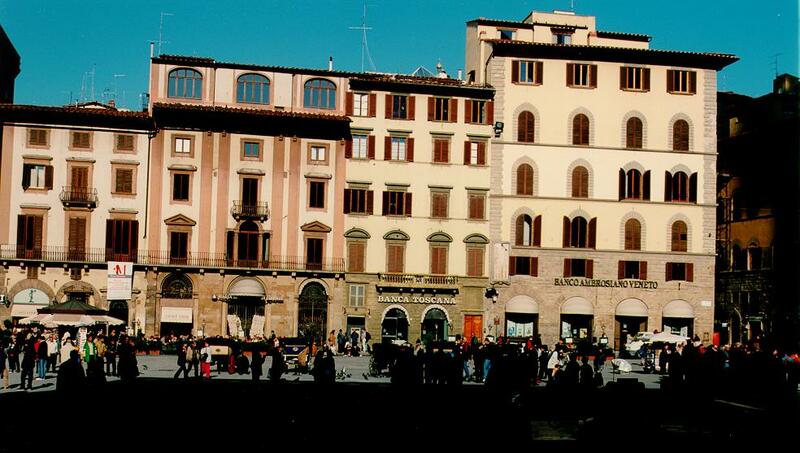 Piazza della Signoria is quite attractive, filled not only with sculpture, but with old world style buildings. 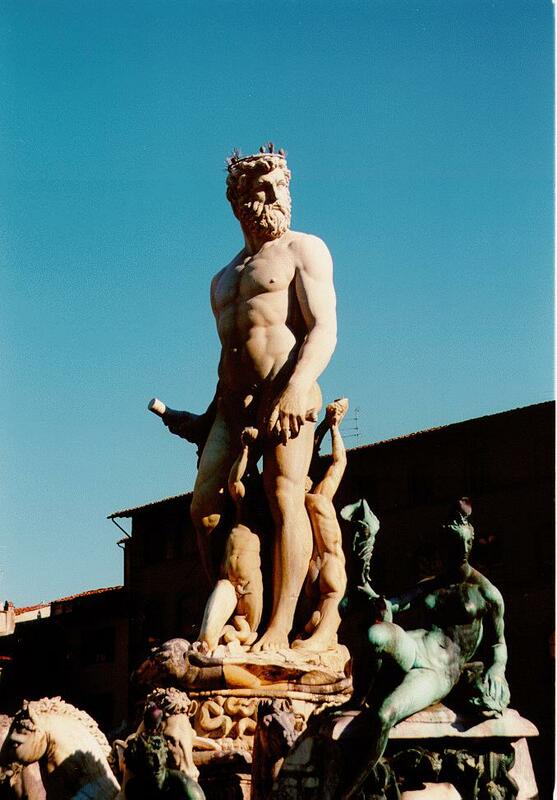 The sclupture includes the famous Neptune Fountain. 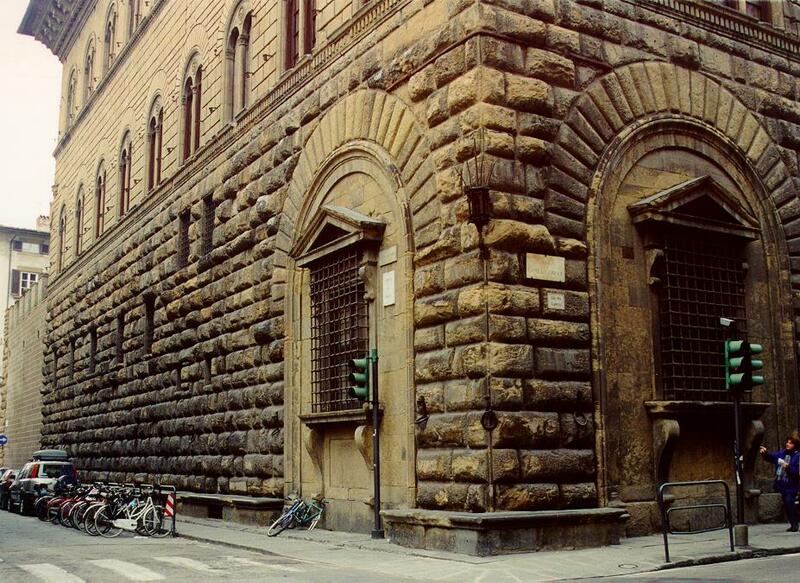 We were just walking down a street, headed for the Accademia, when I spied a building I recognized from my college art history class, the Palazzo Medici-Ricardi by Michelozzo. If you look closely you can see that the stonework in the palazzo goes from very rough at street level, to very fine towards the roof. This was meant to suggest that things get better the closer you get to heaven. 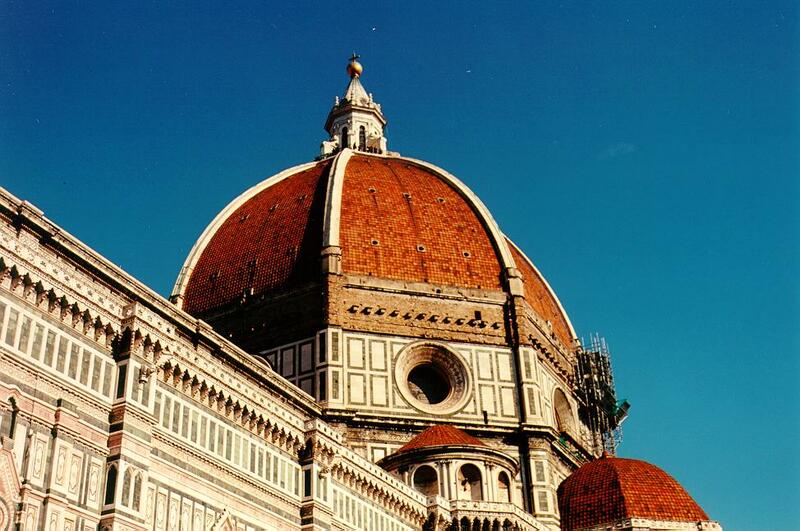 Sooner or later you gravitate towards the Duomo and Brunelleschi's Dome. You can see this structure from many places in the city. 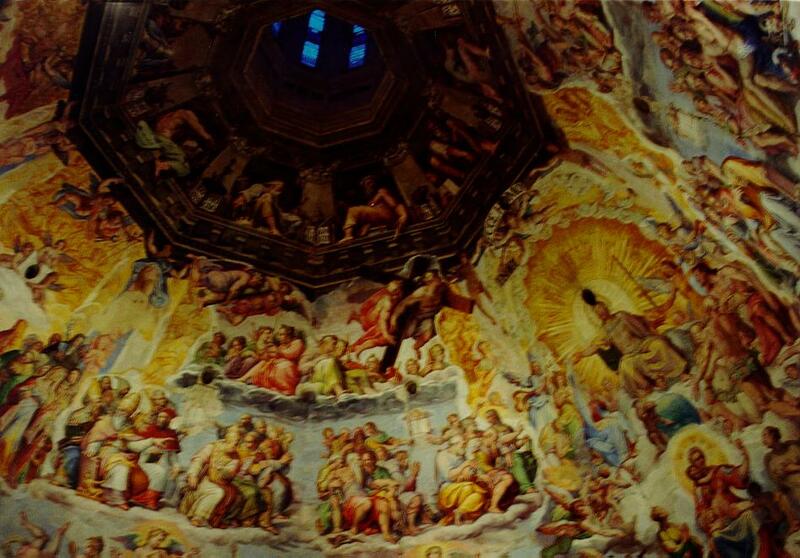 While the cathedral itself is impressive, it is the Dome that is truly remarkable. 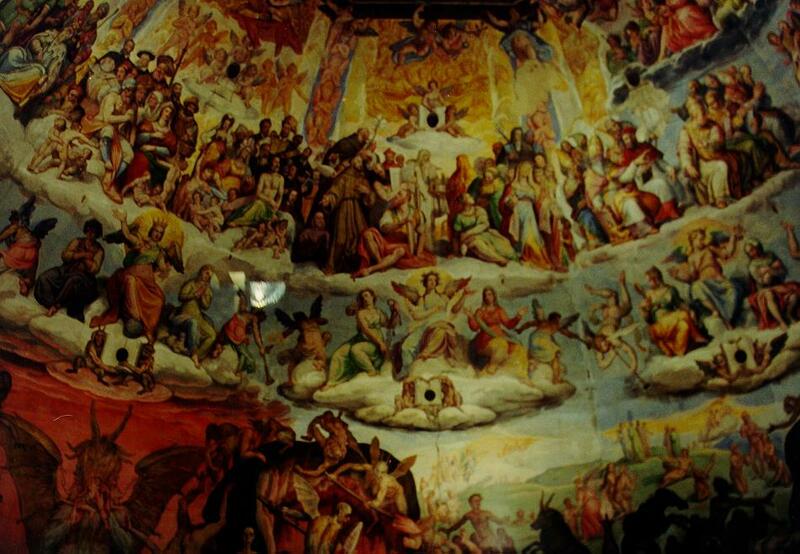 You can walk up to the top of the dome where you can view the ceiling which is covered with a giant fresco depicting Judgment Day, a very popular subject for artists during the Italian High Renaissance. A closeup of the fresco shows the amazing detail. 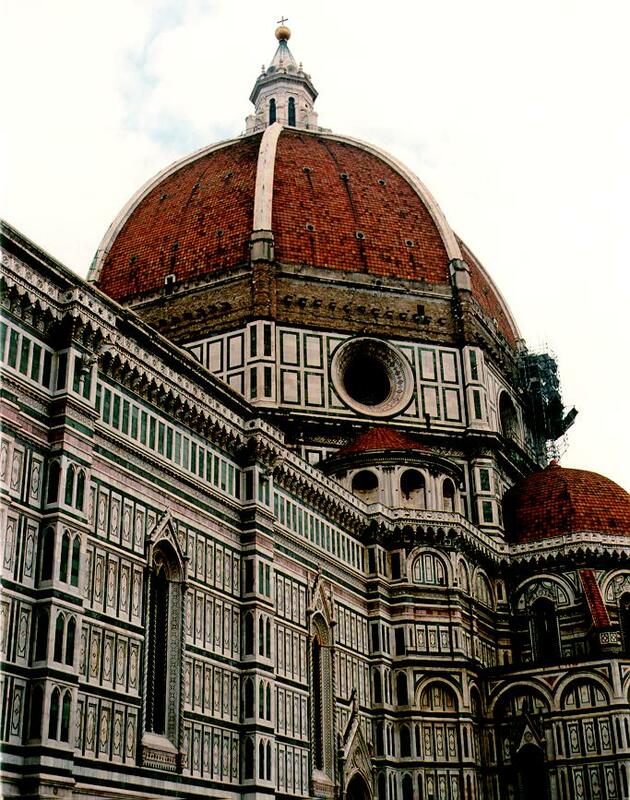 There is an observation platform at the top of the dome and from it you can get some incredible views of the city, such as Florence at twilight, and Florence when it's starting to get dark because your wife waited too long to decide to go to the Duomo. 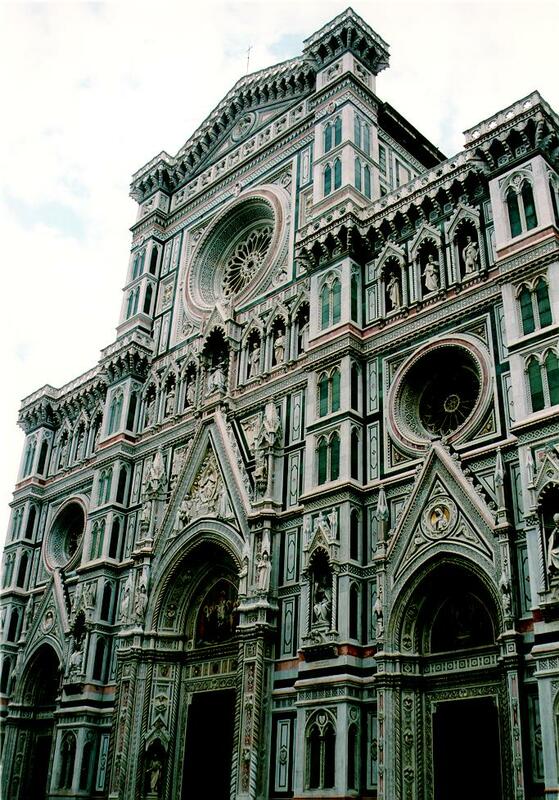 Directly adajacent to the Duomo is the Baptistery of San Giovanni. 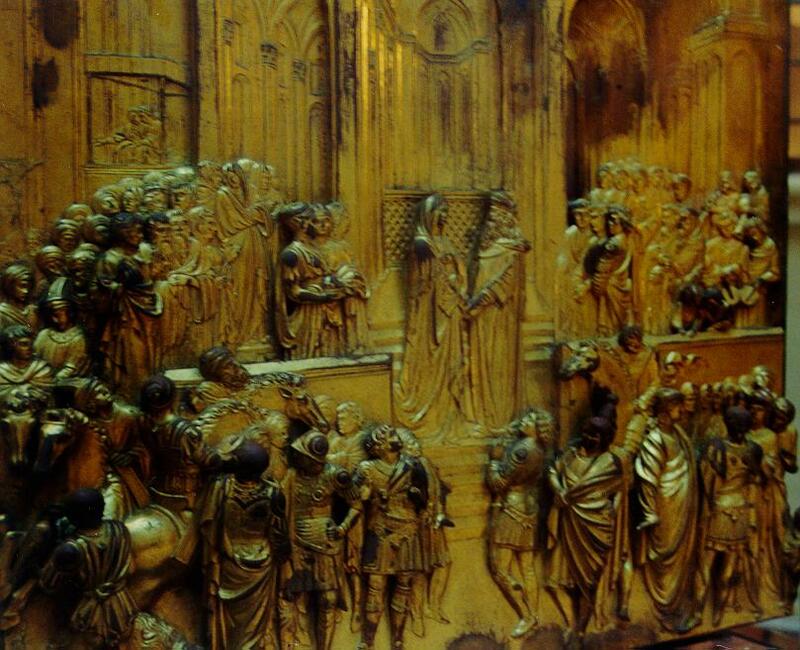 It is famous for its three sets of bronze doors. The east doors to the Baptistery were constructed as the result of a competition among various artists. 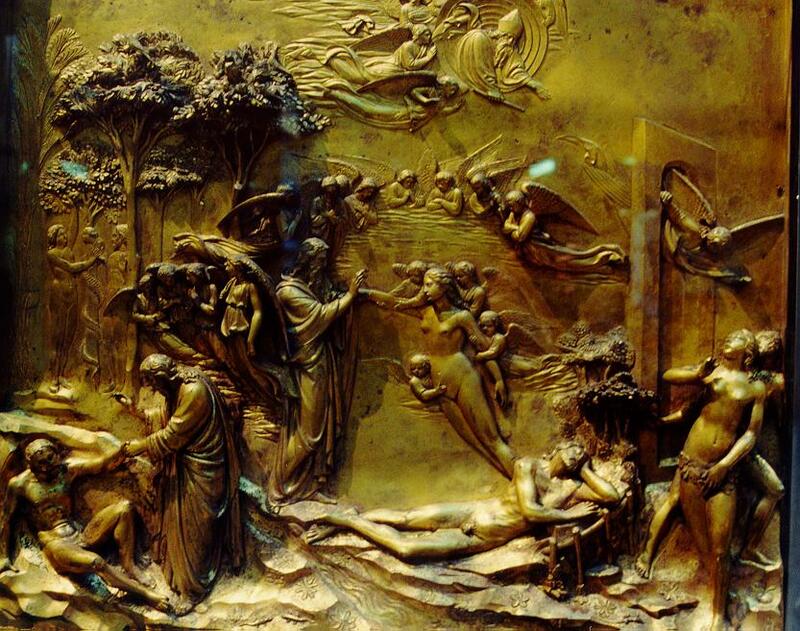 The winning entry was from Lorenzo Ghiberti and these doors were called the "Gates of Pardise" by Michelangelo. The individual panels have been removed and replaced with copies. 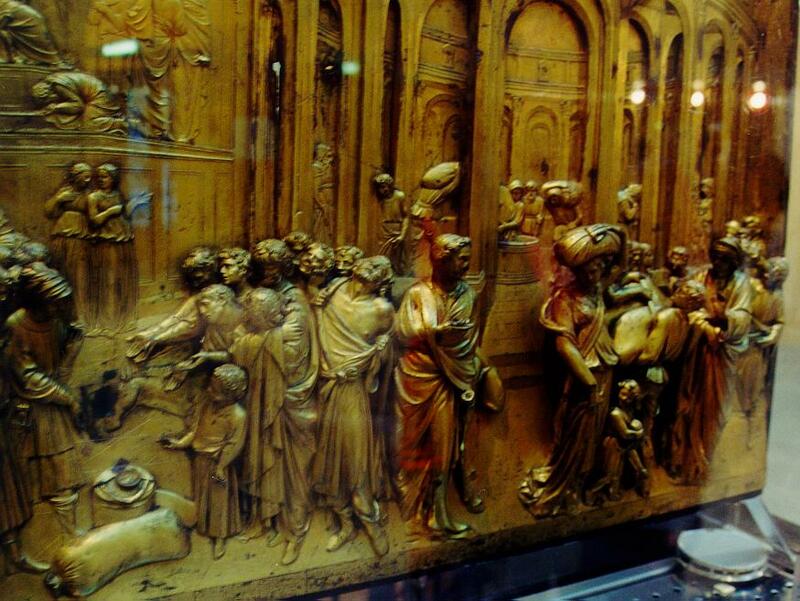 The original panels are in the Museo Dell' Opera and six are reproduced below. 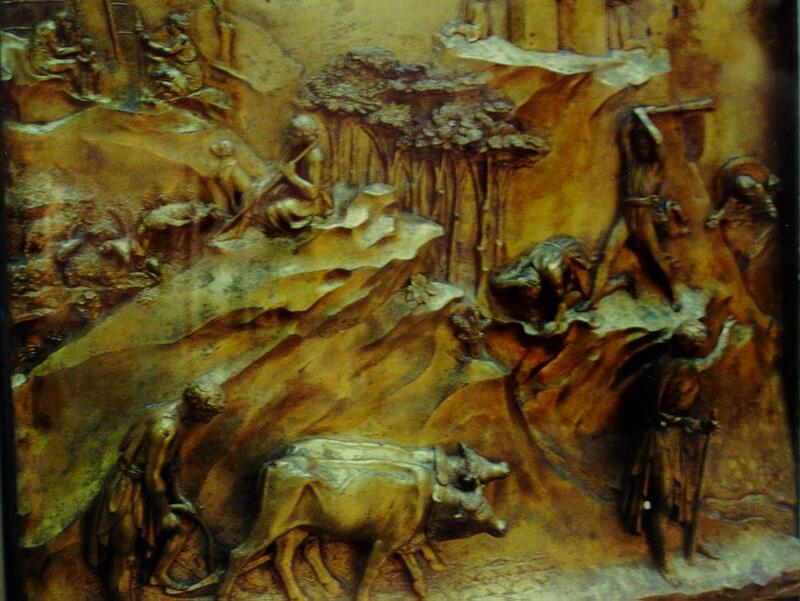 There are ten panels, each based on a story from the bible. 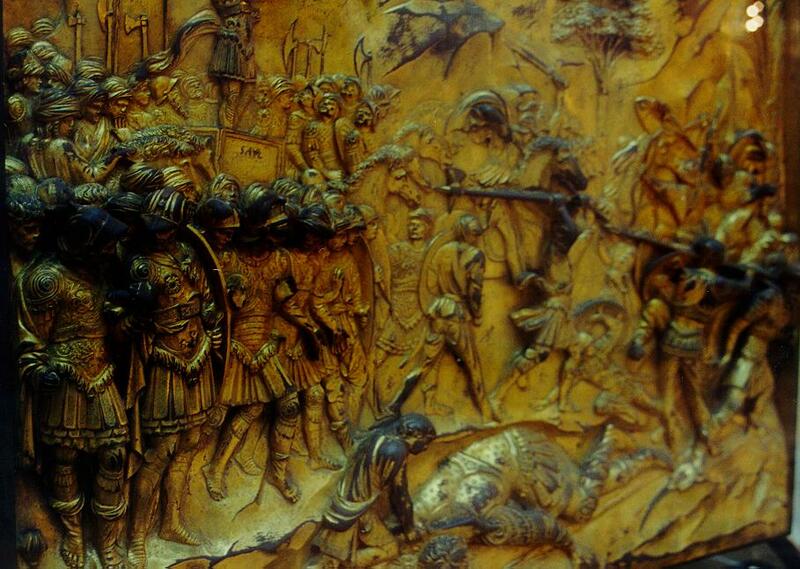 They are done in bas-relief and the photos do not do them credit (they are displayed behind bullet-proof glass). 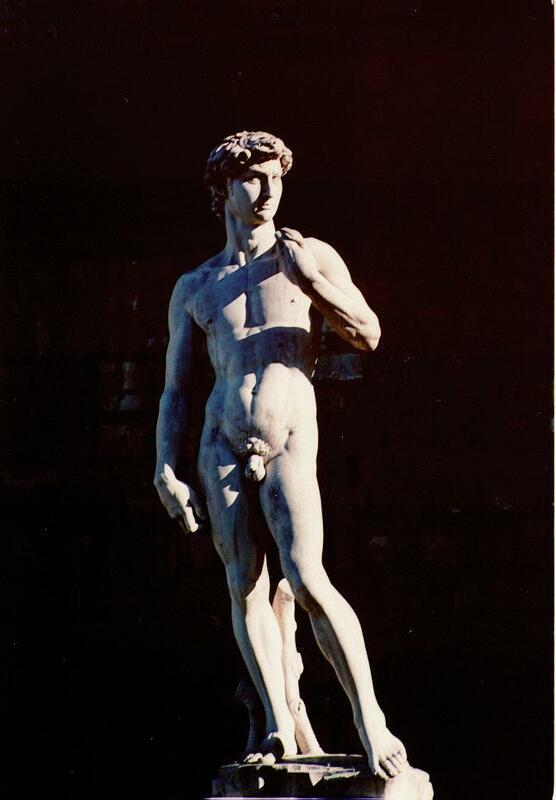 Michelangelo's David (the original) is located in the Accademia museum. 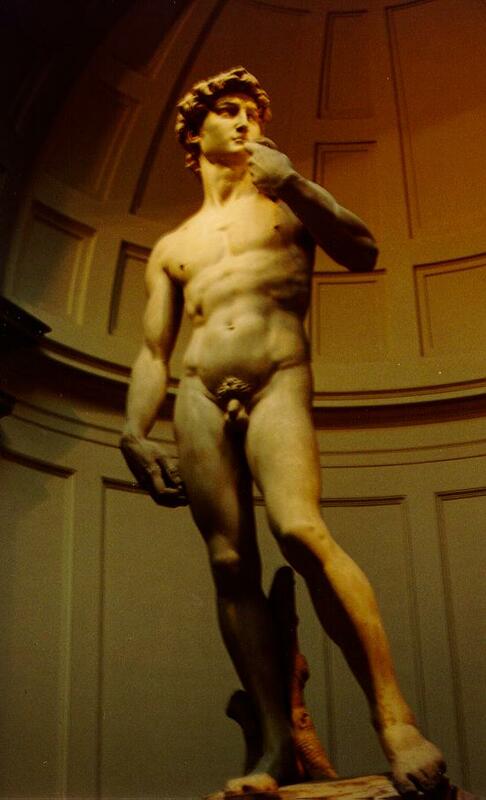 Here is a closeup of Michelangelo's David. 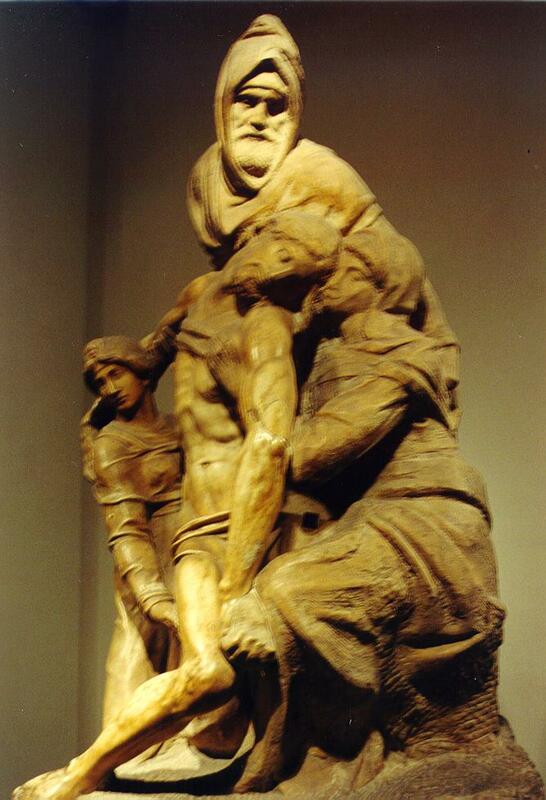 Michelangelo's unfinished Pieta, which was intended for his tomb, is also located here. The story commonly told is that he smashed the unfinished work in a fit of rage. 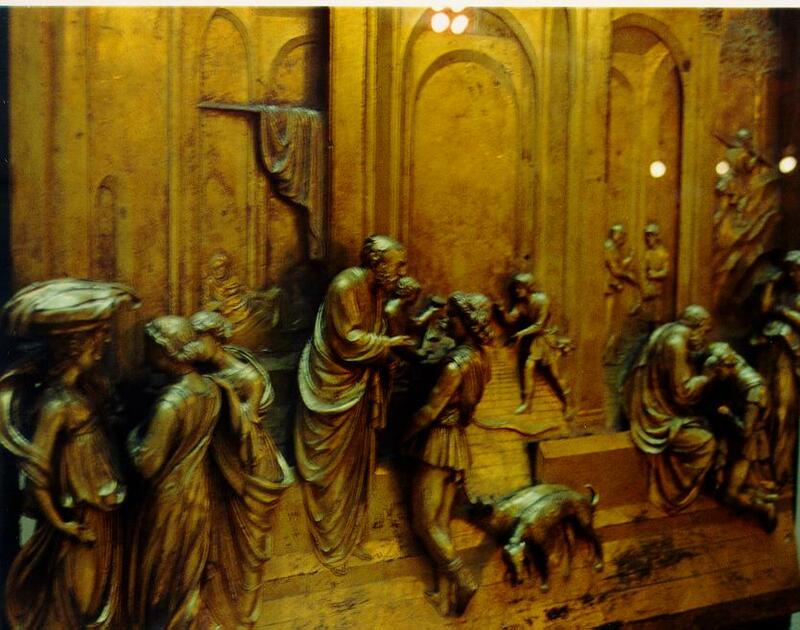 However, most historians believe the work was damaged because of a flaw in the marble. 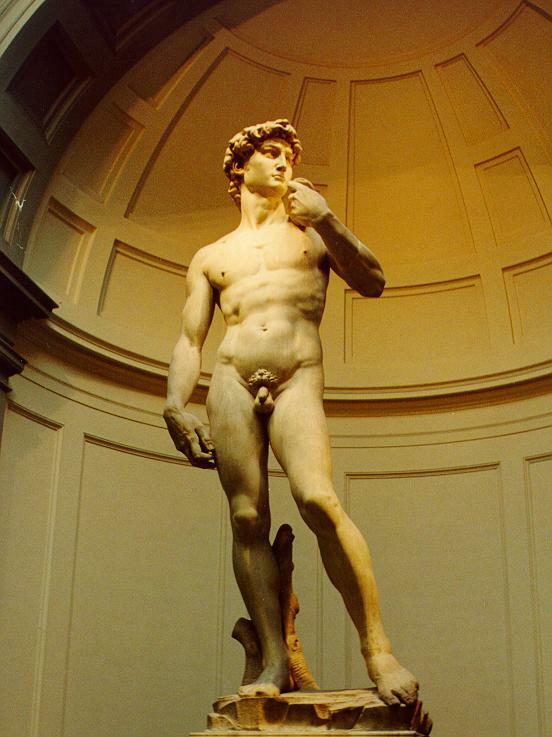 When Michelangelo struck the right thigh of Christ with his hammer and chisel, it shattered. You can see in the photo a square hole where an attempt was made to repair it. 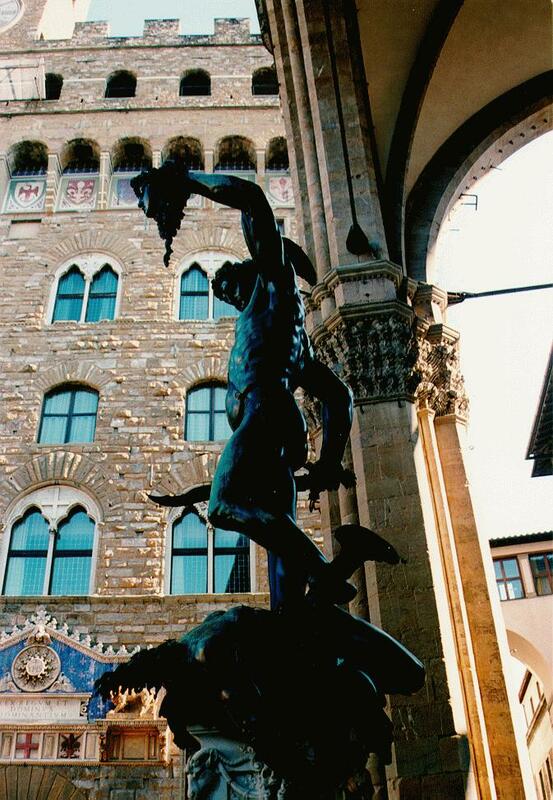 No visit to Firenze is complete without a visit to the Uffizi Museum, officially the Galleria degli Uffizi. If you go in the summer, the wait in line for entrance can be several hours, and you will have a hard time seeing the artworks because of the crush of people once you get inside. We deliberately went in November to avoid crowds and in that regard we were successful. We did not wait at all to get into the Uffi, and were able to spend several hours viewing the art in an uncrowded atmosphere. 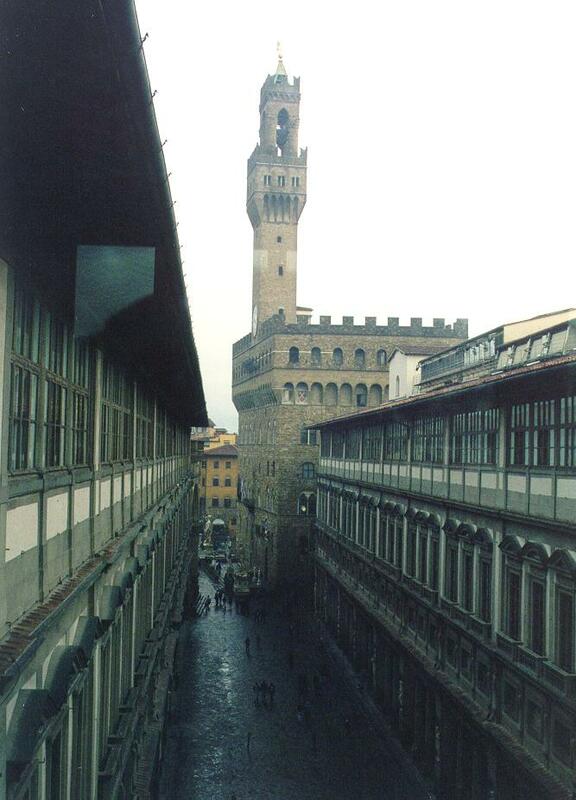 There are some great views to be had from the windows of the Uffizi. 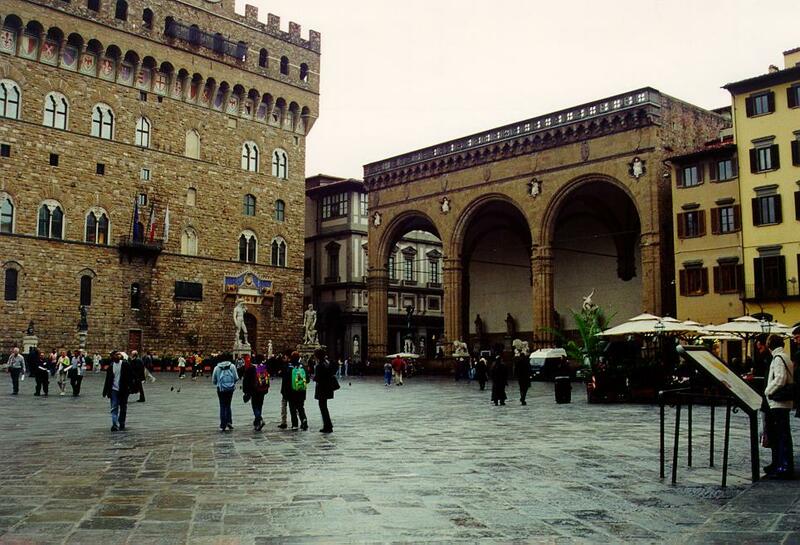 For example Palazzo Vecchio is clearly visible between the twin arms of the Uffizi Museum. 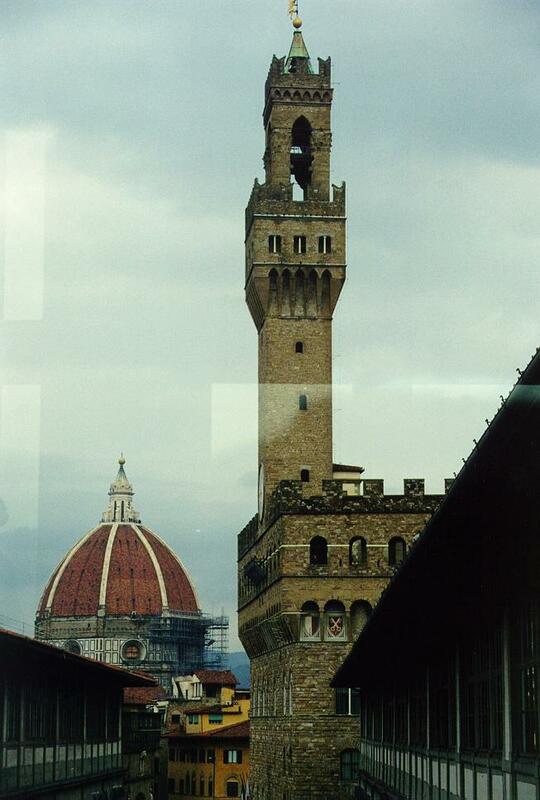 By moving a few feet you can view Palazzo Vecchio and dome of the Duomo as well. From another window you can see the Ponte Vecchio. 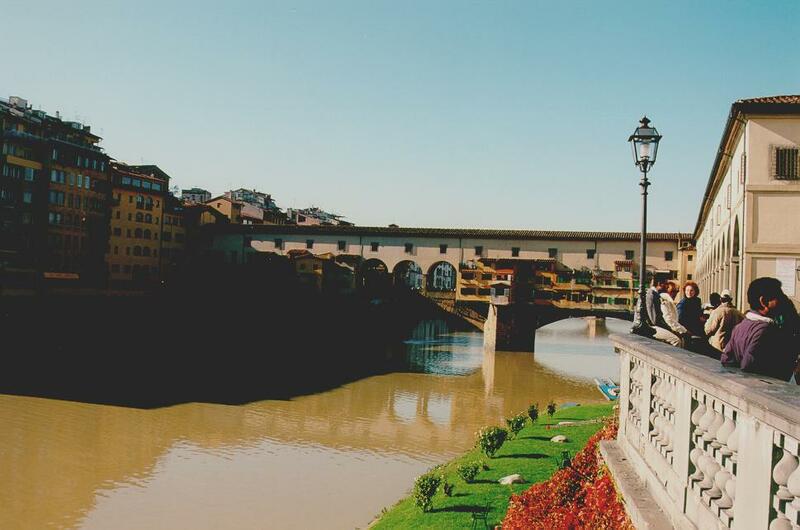 As you can see, there are quite a few bridges over the Arno beyond the Ponte Veccio. 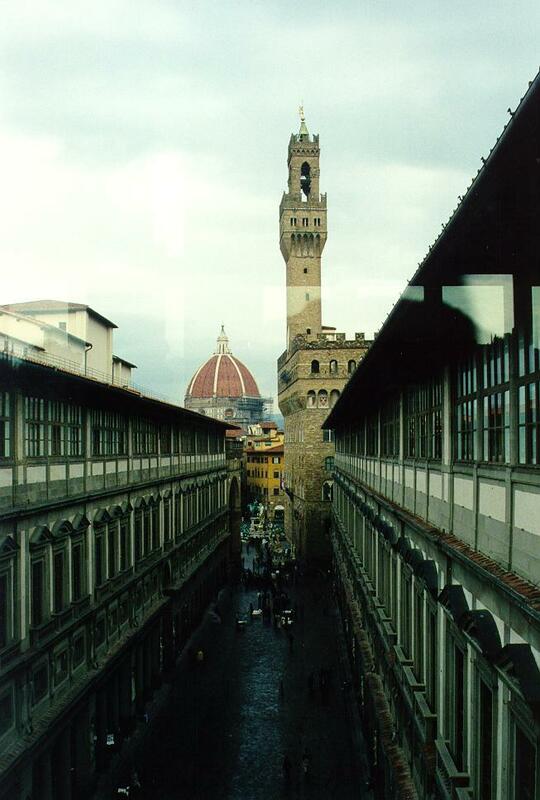 You can also clearly see the twin corridors that form the main part of the Uffizi Museum. 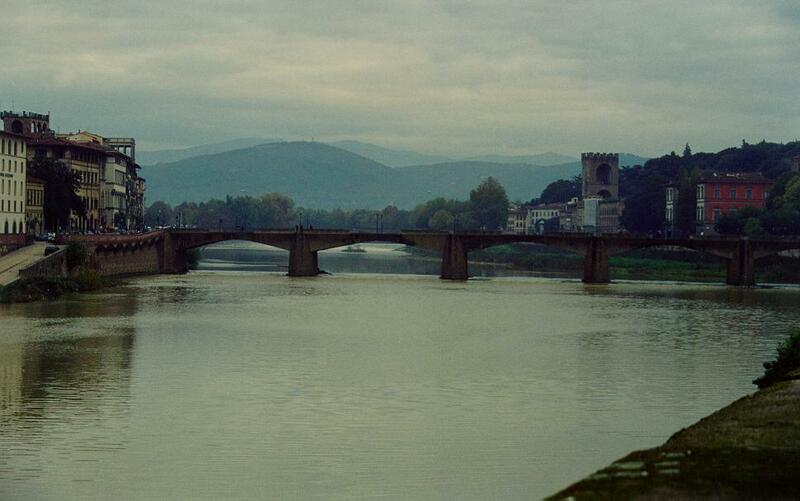 Most of the time we were in Italy, it was either raining, or overcast and hazy, as this photo of a bridge over the Arno illustrates. We decided to check out of the Shereton Firenze and drive to Carrara, location of the marble quarries (cave de marmo) where Michelangelo obtained the stone for his sculptures. We departed Firenze on the A11 Autostrada headed west passing Prato, Pistoia, Montercatini, and Lucca before intersecting the A12 Autostrada along the coast at Viareggio. 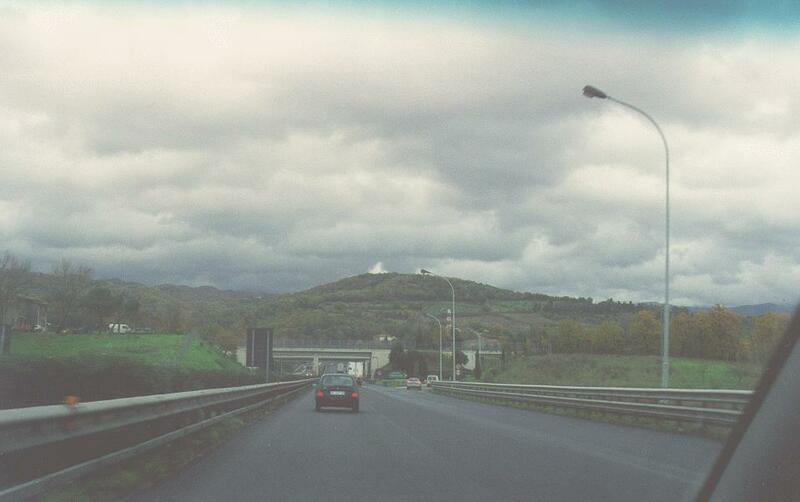 We headed north and followed the signs to Carrara. 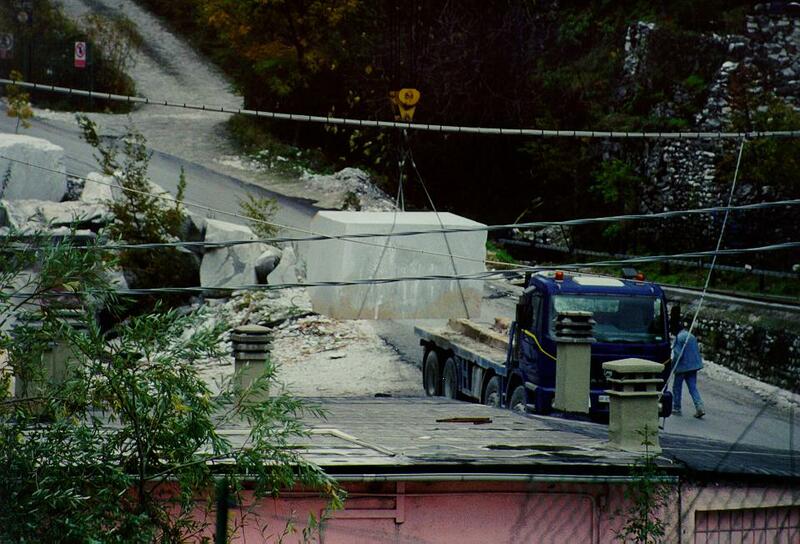 Even before we exited the Autostrada, we saw huge white blocks which we at first mistook for shipping containers. It was only later we discovered these were blocks of rough cut marble awaiting shipment to Home Depots throughout America for use in bathroom and kitchen countertops and foyer floors (just kidding). There were thousands of these huge blocks. 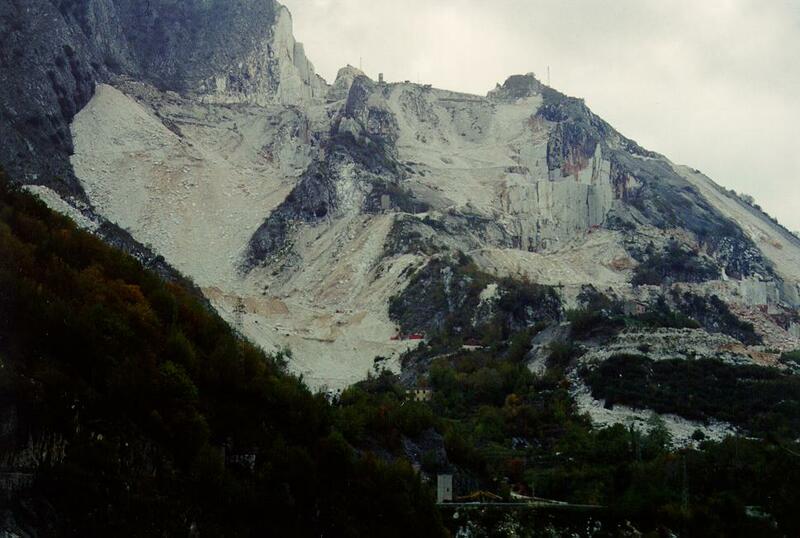 Carrara is a picturesque town which fills and entire valley leading up towards the mountains where the marble is quarried. 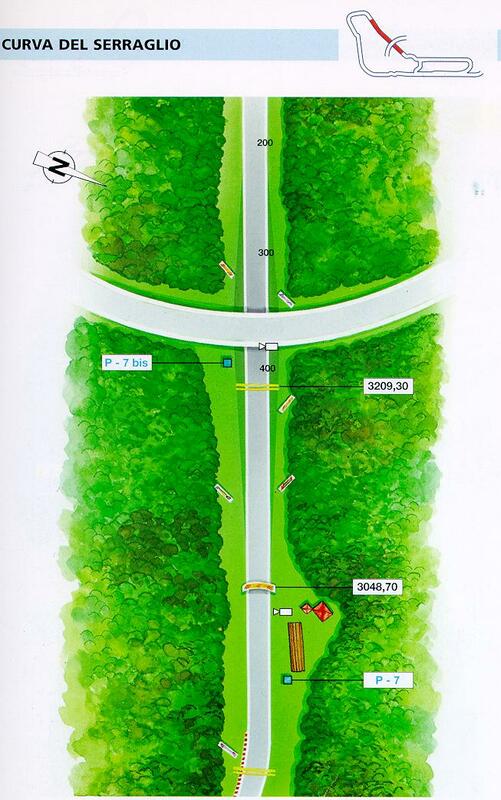 The roads up to the quarries are narrow and twisting, and in some cases are marked one-way traffic only. 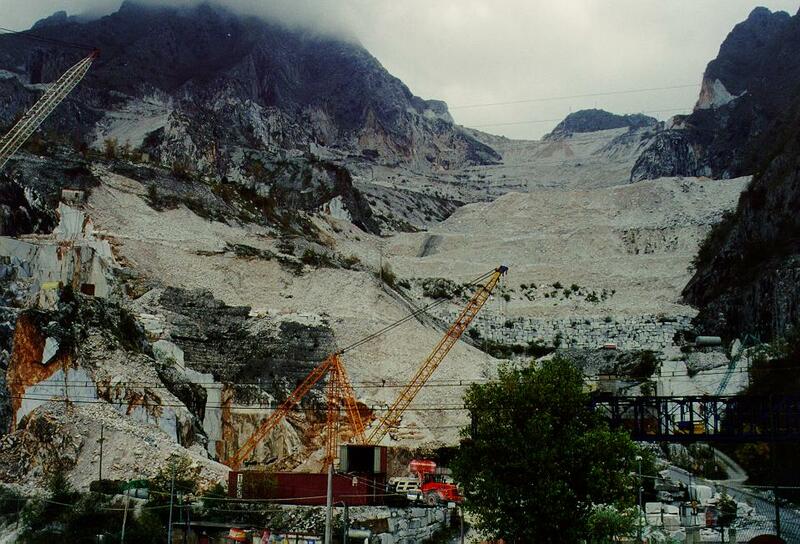 What we thought from a distance were snow covered peaks were actually marble quarries. We arrived at a quarry, parked the Mercedes, and began walking around. 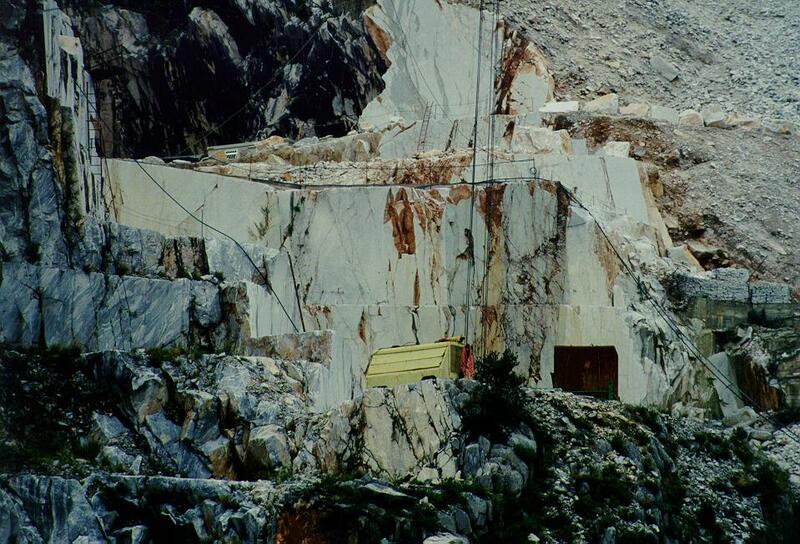 The quarry was in full operation and we watched as they loaded a freshly cut block of Carrara marble onto a truck for transport to the harbor. We noticed that there were several types of marble. Some was snow white, while other types were speckled with streaks of brown. 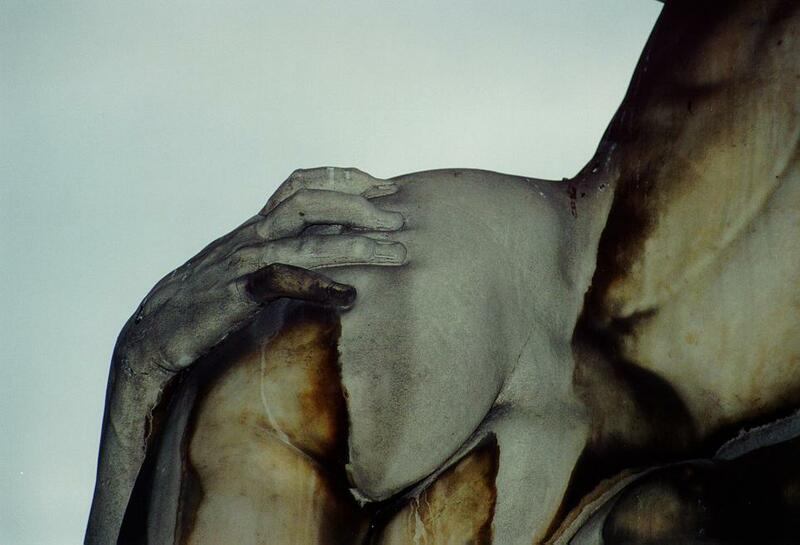 There was a large shop which sells marble sculptures (want a Pieta for your front lawn? They have it but they don't deliver) with an attached museum. 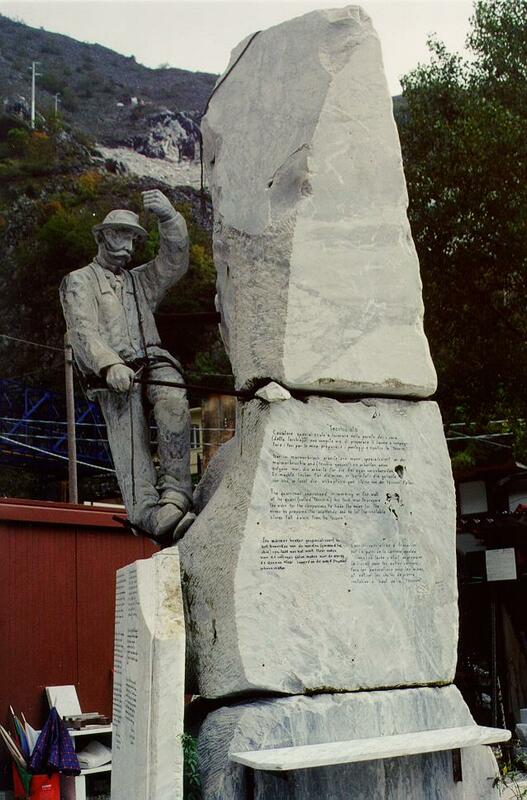 The museum featured a monument to marble quarry workers. It had been raining on and off and looking back down the mountain towards Carrara we decided it was time to find lodgings for the night. 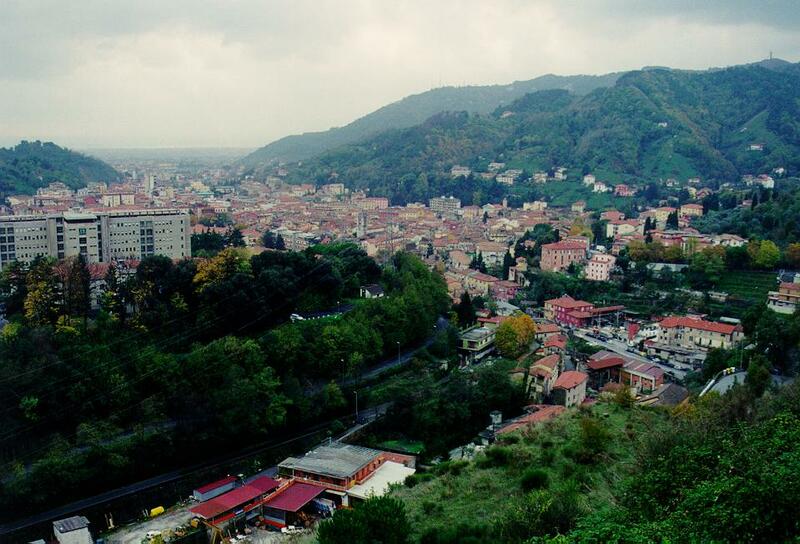 We had a great view of Carrara as we descended the mountain. We left Carrara and returned to the A12 Autostrada and proceeded to the town of La Spezia, a harbor city with many ships at anchor loading and unloading cargo. We wandered around the city center but could not find a hotel that looked appealing and so I made the mistake of deciding we should drive to Milan. We headed north on the A15 Autostrada and blundered into a torrential downpour that got worse the further north we drove. It soon got dark, adding to the unpleasentness of the situation. There are 11 tunnels on this stretch of Autostrada and the road is very twisty, but we still managed to make good time. Italians drive well in the rain fortunately, and only the long lines of heavy trucks slowed our progress. We finally rejoined the A1 Autostrada west of Parma and headed west towards Milano, with the intention of spending the night there and then exploring the next morning. However, we soon discovered that most of the hotels in Milano were full, so we accepted a suggestion from one hotelier and proceeded to the town of Gallarate, near Malpensa airport, to the Jet Hotel. Upon arrival there however we discovered that they too were full. 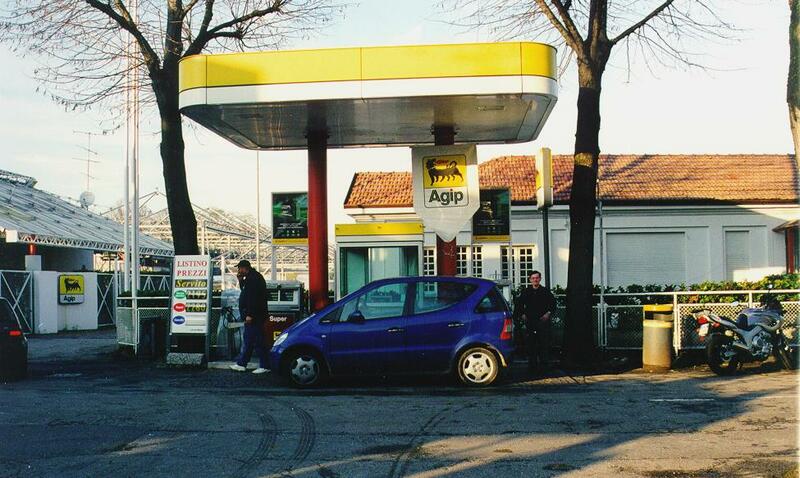 We settled for a small motel-type accomodation in the nearby town of Busto Arsizio. 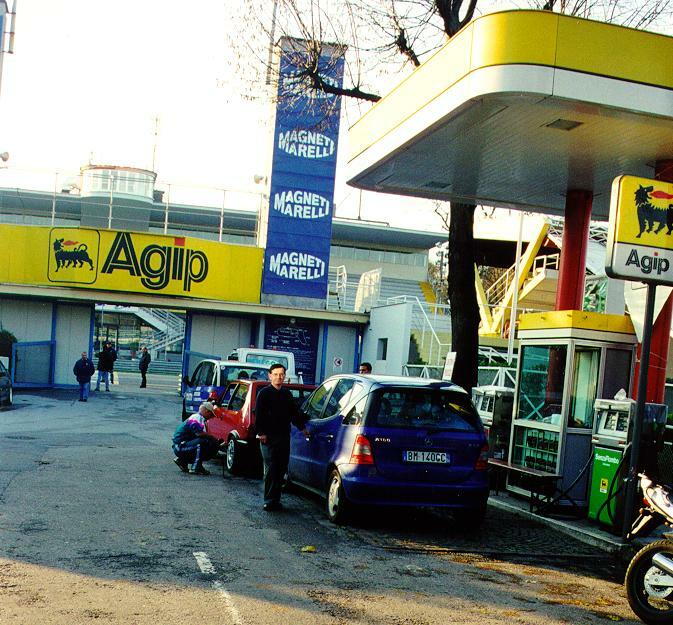 The next morning we left Busto Arsizio and retraced our route along the A8 and A1 but this time we decided to stop in Modena to spend the night and then drive south to visit the Ferrari factory in Maranello the following day. We selected the Modena Holiday Inn (Via Tre Olmi 19 - Modena, Italy ) to spend the night. The Holiday Inns in Italy are great places to stay. There is just enough familiarity to make you comfortable and they all have great restaurants attached. The Modena Holiday Inn is clearly visible on the south side of the A1 Autostrada. 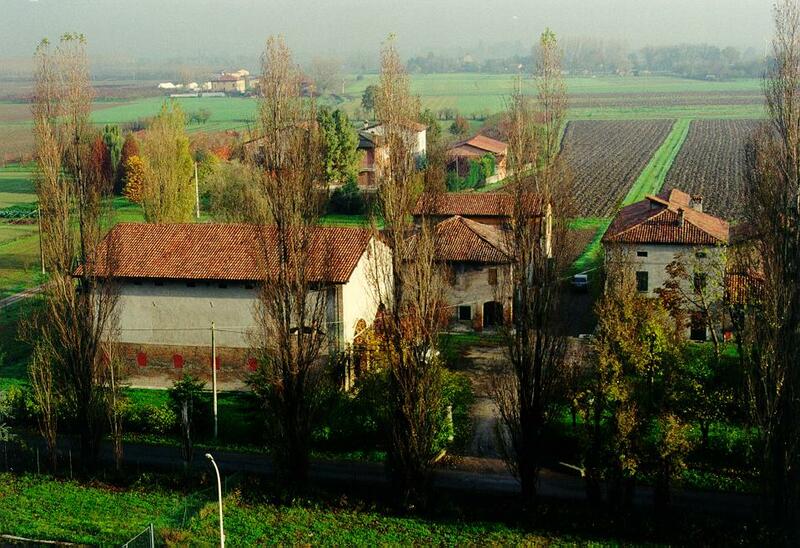 The countryside around Modena is absolutely gorgeous. The Ferrari factory, as well as the official Ferrari Museum, the Galleria Ferrari, is located in Maranello, south of the city of Modena. 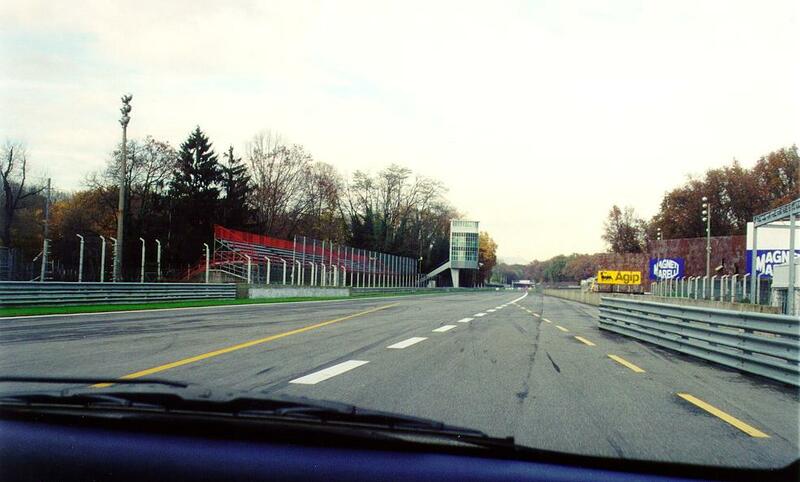 It is a plasant drive south from Modena to Maranello. We arrived in Maranello one month after Ferrari had clinched both the Formula 1 Constructor's Championship, as well as the Formula 1 Driver's Championship (Piloti Micheal Schmacher), so every building in Maranello had a huge Ferrari flag flying. 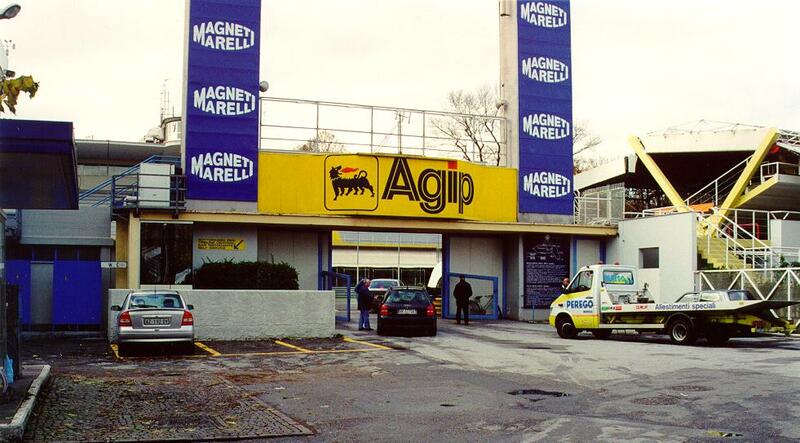 This is the home of the world famous tifosi and they were extremely proud of Ferrari's accomplishments. 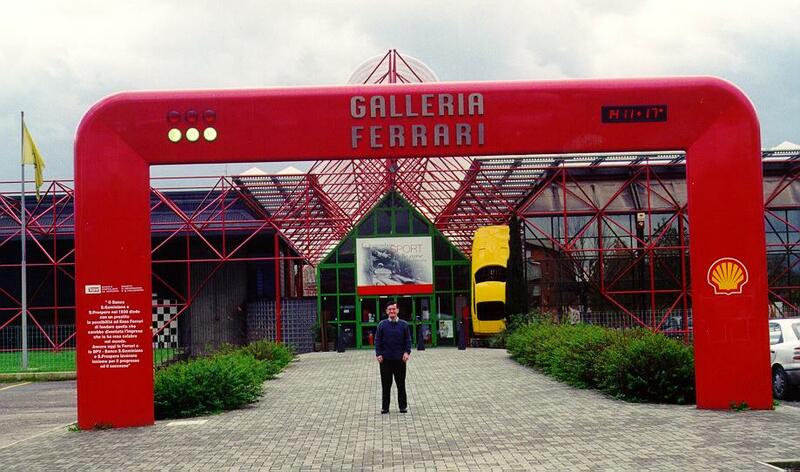 We found the Galleria Ferrari with no trouble and here is one of those "Kilroy Was Here" photos of me at the entrance to the Ferrari Museum. 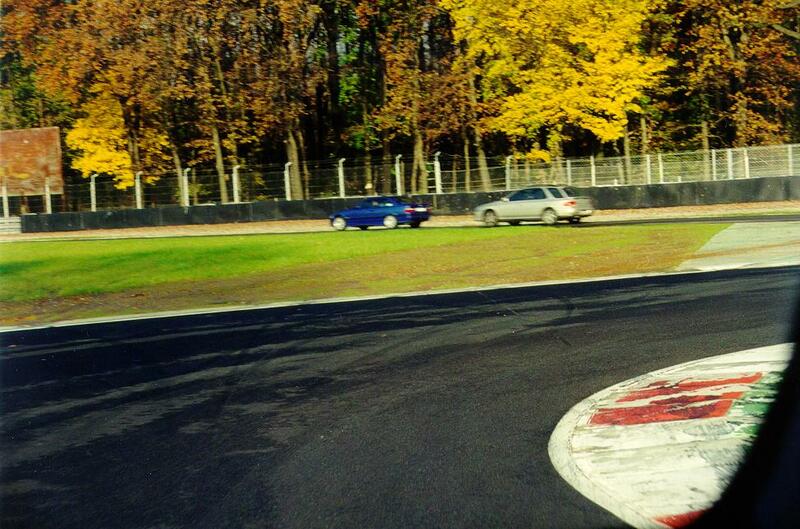 No, the ground did not slope up from the left to the right, that's my wife's photographic interpretation of the moment. The museum itself, although obviously a shrine to the tifosi and Ferraristas worldwide, is not all that big, and not all that impressive. It costs about $10 per person to enter and was crowded even in the November off-season. 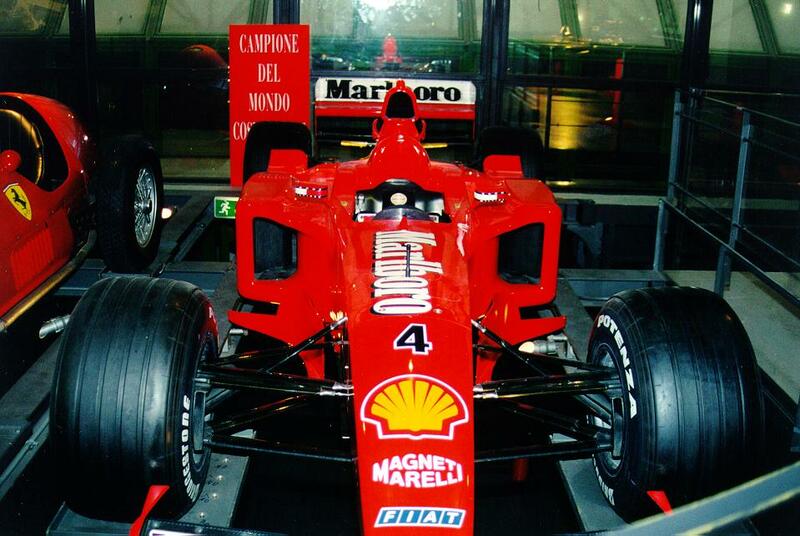 There are static displays of cars such as the Ferrari F1-2000 that won the 2000 Constructors Championship. 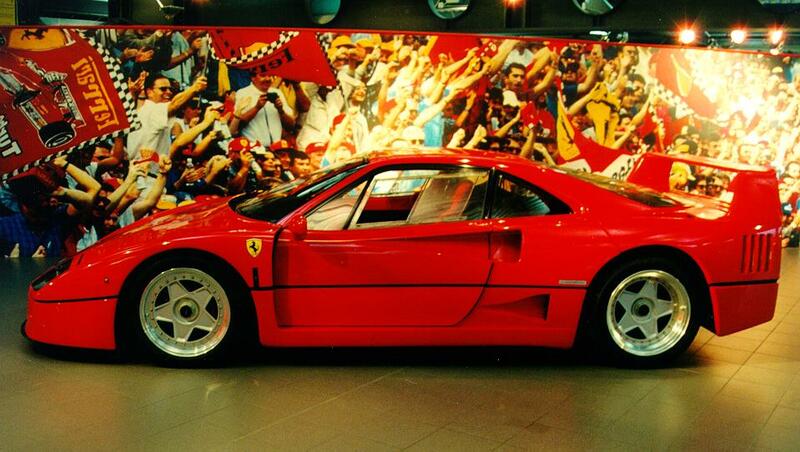 There are also several very exotic Ferrari production cars, such as the Ferrari F40. 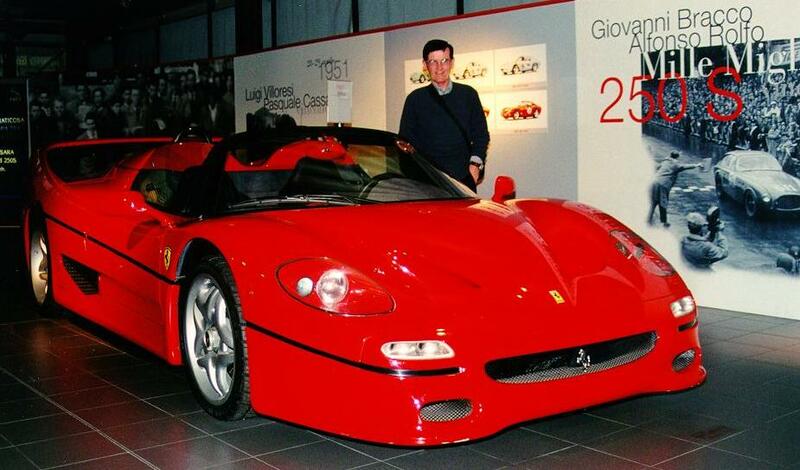 The car I liked the most however was the Ferrari F50 Spyder. That's me lusting after it in the photo. 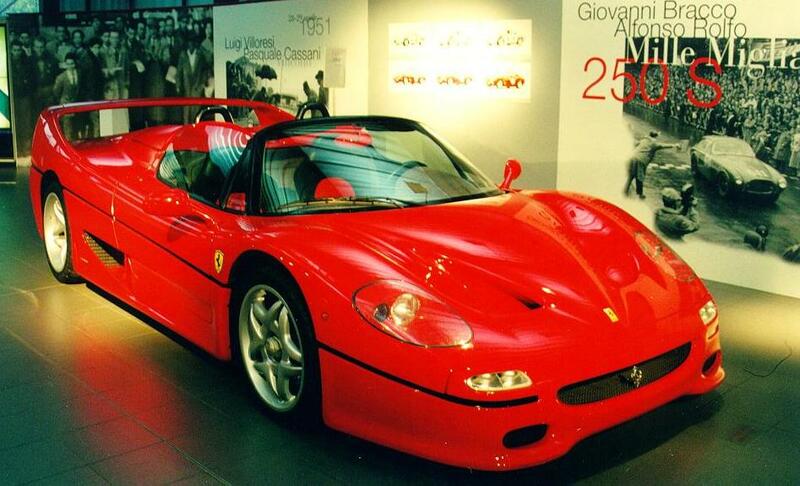 Here is the F50 by itself. After leaving Galleria Ferrari we walked about 100 yards to the front entrance to the Ferrari factory. They usually don't give tours of the factory but I work for a sponsor of the Scuderia Ferrari F1 team and that was enough to get us admitted. The only restriction was no photography allowed. I have been to the Corvette assembly plant in Bowling Green, Kentucky, and there is absolutely no comparison to the assembly of a Ferrari. It takes much longer and most of the work is performed by hand. 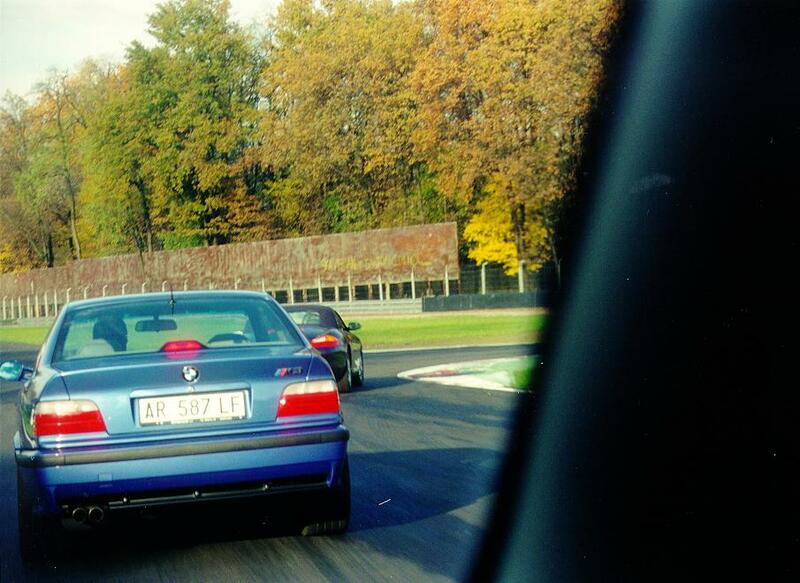 Most of the cars we saw were 360 Modena spyders and coupes in various stages of construction. 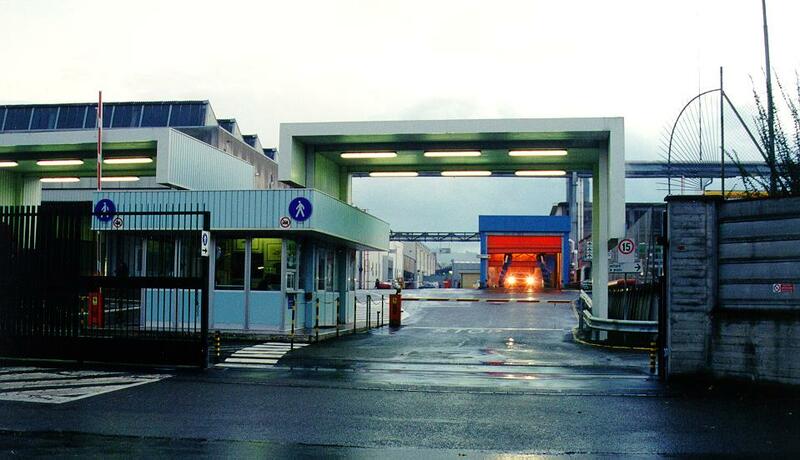 After the tour we walked around to the side entrance of the factory were they accept deliveries and where employees enter and leave. 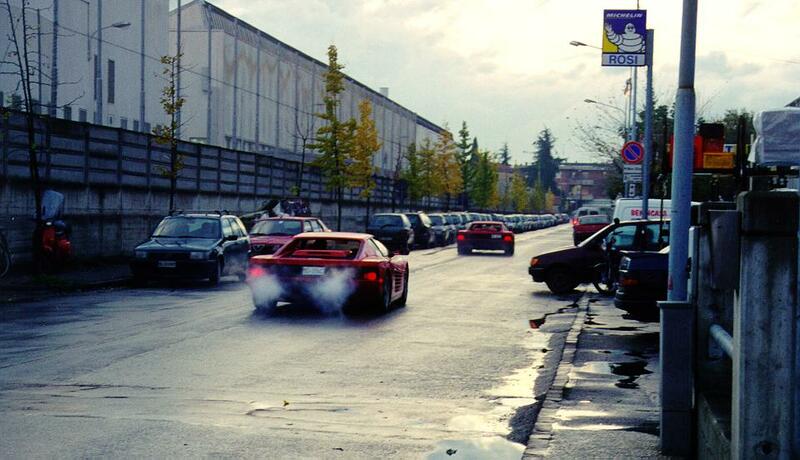 I managed to capture two Testarossas leaving the factory and they were moving rather rapidly on the narrow street. 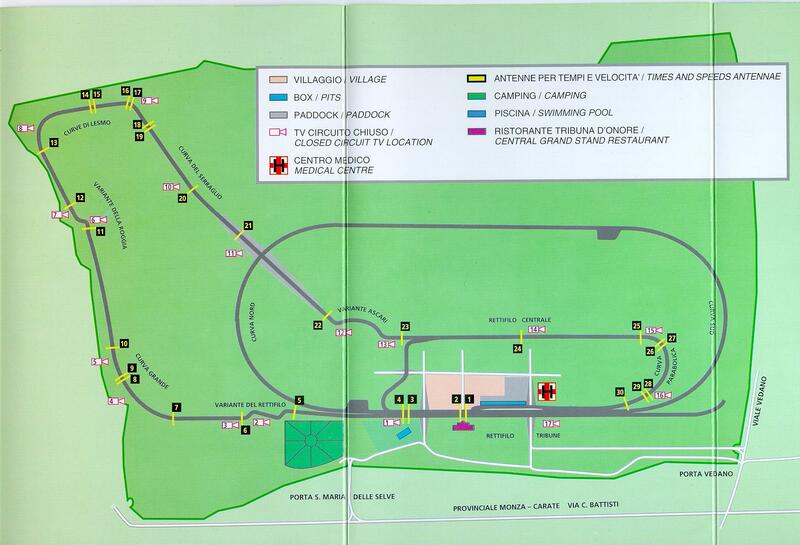 I had wanted to see the Ferrari test track which I assumed was in the nearby town of Fiorano. 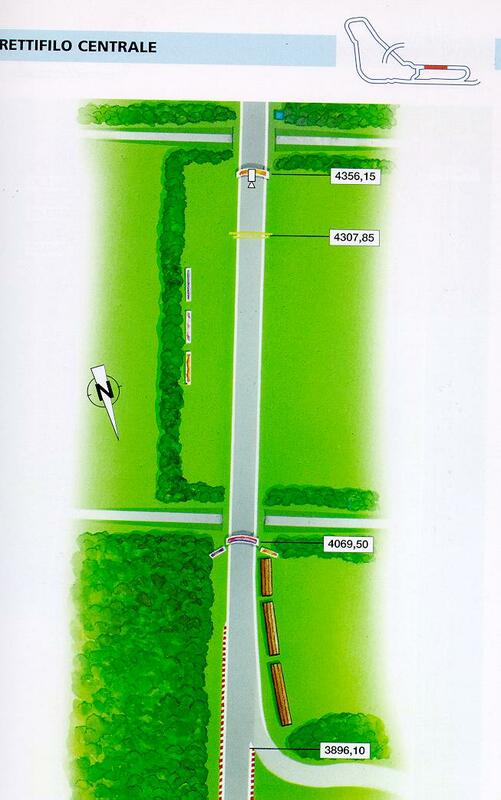 You would think that was a logical assumption since it is referred to as the "Fiorano test track" in various publications devoted to cars in general and Ferraris in particular. 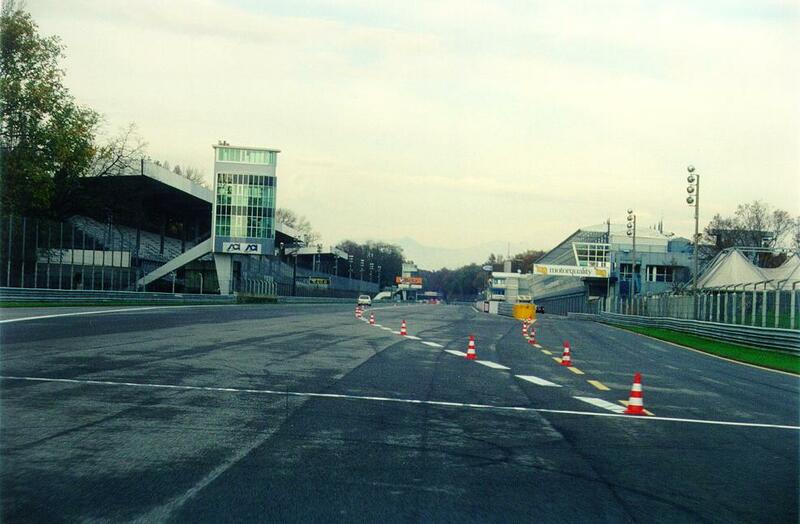 We drove all around the town of Fiorano but never found the track or anything that remotely resembled a race track. We inquired about this is a souvenir shop across from the Ferrari factory and a nice lady gave us the directions. 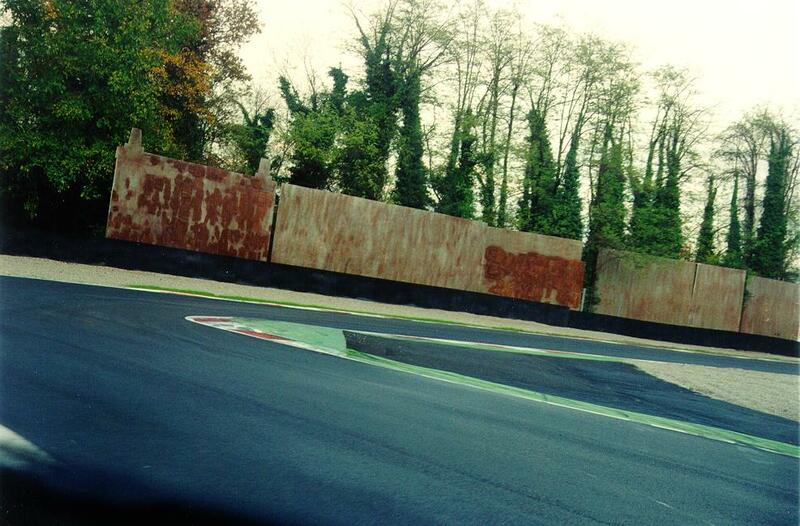 We drove about three hundred meters up the road from the Ferrari factory and found the Fiorano test track. 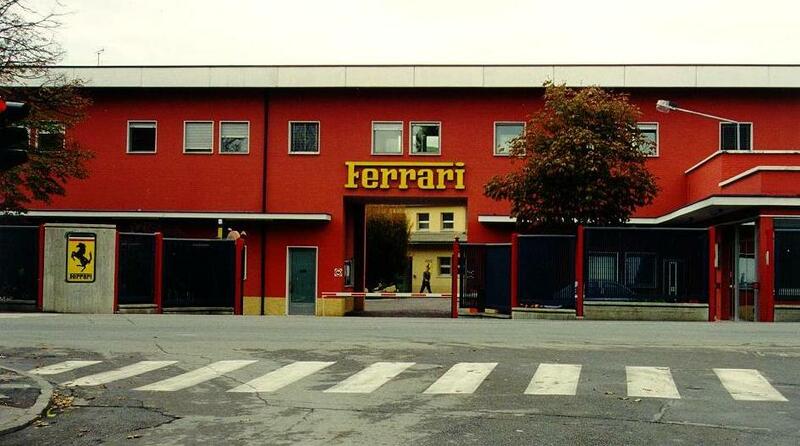 It is actually in Maranello. We bid farewell to Maranello and headed back to spend the night in Modena. We spent a few hours driving around the city and then headed back to the hotel. The following morning we again drove south to Firenze, this time with the intention of staying at the local Holiday Inn. This provied to be a wise choice. The Holiday Inn we choose (there are two in the Firenze area) was again on the south side of the Arno, but only a short bus ride from the city center. (Note: here is the address and contact information for this hotel: Holiday Inn Florence, Viale Europa 205, 50126 Florence, Italy; Tel: Int + 390 55 6571 Fax: Int + 390 55 653 18 06 E-Mail: Holiday-Inn-fi@mcsystem.it Web Site: www.holiday-inn.com/hotels/flnit). No more waiting for shuttle buses as we had to do at the Shereton Firenze which was further outside the city. 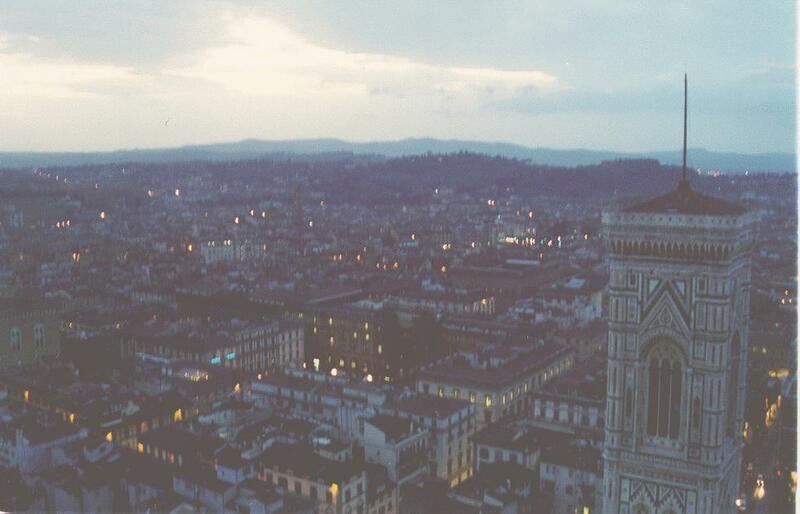 We spent the next several days in Firenze. We visited several museums, and we also did quite a bit of shopping. De[ending on the prevailing exchange rate, you can pick up some genuine bargains in Italy. Most of the products exported from the European continent are marked-up outrageously by the time they reach American consumers. Clothes and leather goods can be especially good bargains as can electronic devices, cameras, and watches. We enjoyed Tuscan cuisine in a number of restaurants and I can report that in 10 days in Italy we never had a meal that was not delicious. If you find yourself gazing at a menu with absolutely nothing recognizable, order "spaghetti alla pomodoro", or spagehetti with tomato sauce. Even if it is not on the menu, every restaurant can and will make it for you if you ask. 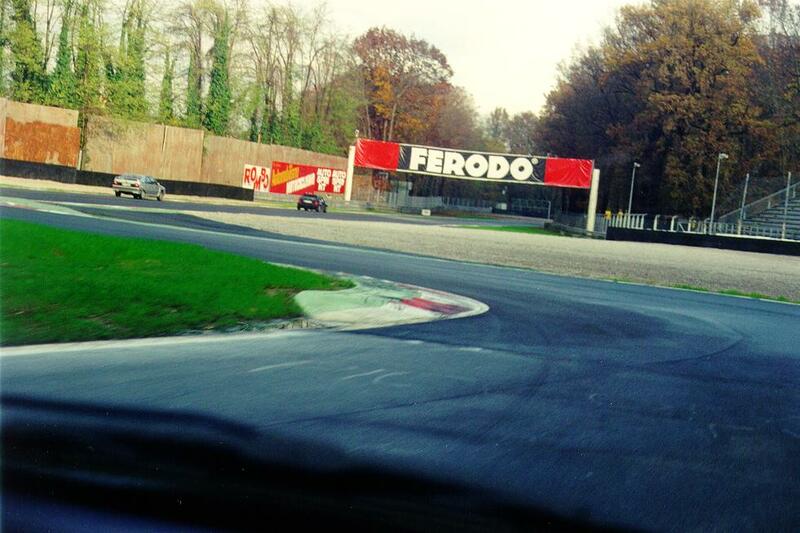 On Saturday, November 18, we drove to Monza, to see the Grand Prix track, the Autodromo Nazionale Monza, and were delighted to discover that on this weekend the track was open for Tourist Laps (Circolazione Touristica). Cost was 50,000 Lira per 30 minute session. 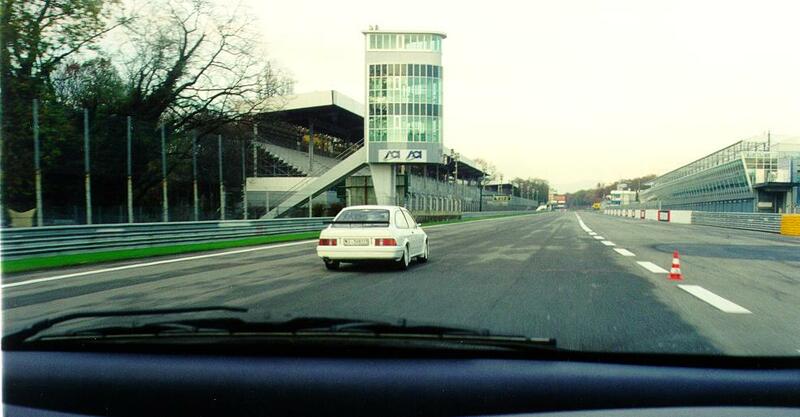 You can take any car on the track. You do not need a helmet. 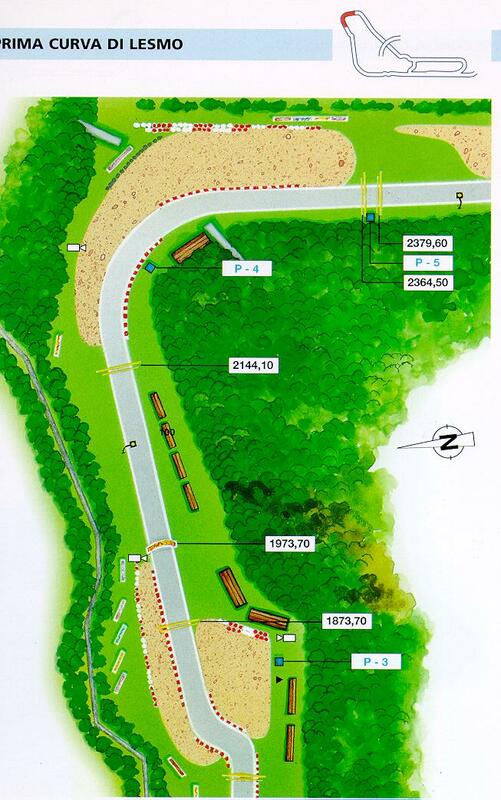 You are permitted to drive as fast as you are able around the 3.58 mile (5.77 kilometer) circuit and there are other cars on the track with you. 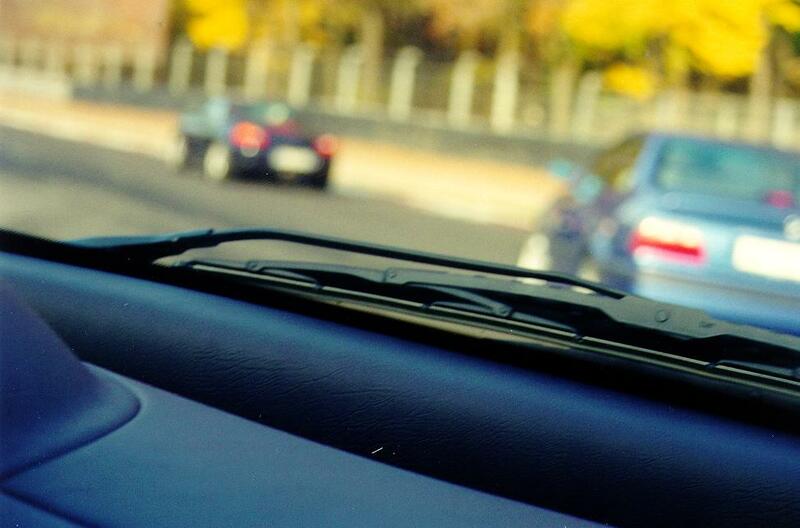 My wife rode with me and took photographs from the passenger seat of the trusty little Mercedes. 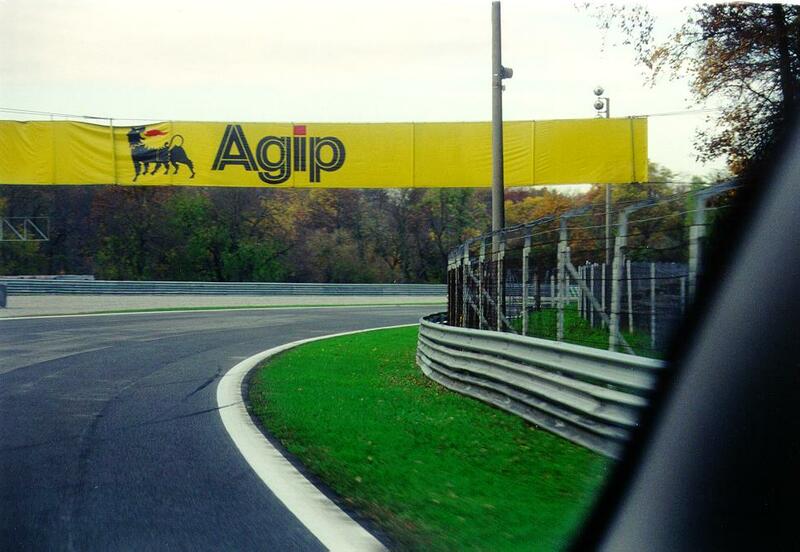 All the course marshal said to me as I entered the track was "capice bandera rossa? ", did I understand what to do if they waved the red flag. I replied "si, capisco" and they waved me off. As soon as I was at the blend line to enter the circuit from the pit lane, I floored the little 1.6 liter engine in the Mercedes. I arrived at the breaking area for the first chicane and discovered that this chicane, the Variante Del Rettifilo, is a very challenging. 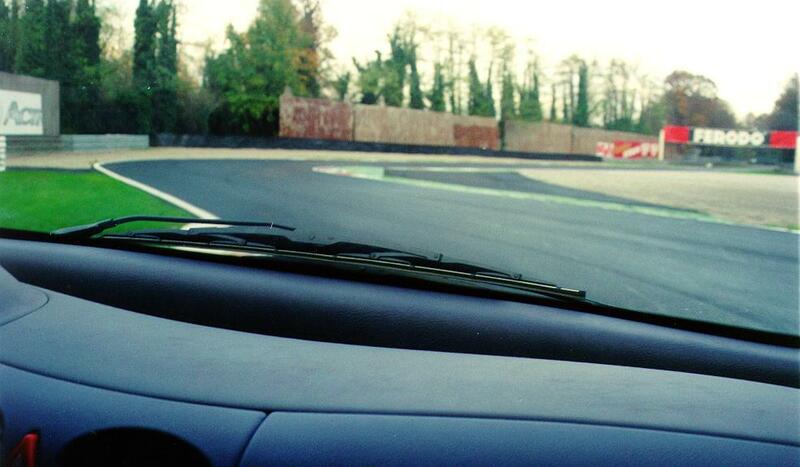 You absolutely must apex the turn on the rumble strips or the car will push rather severely. 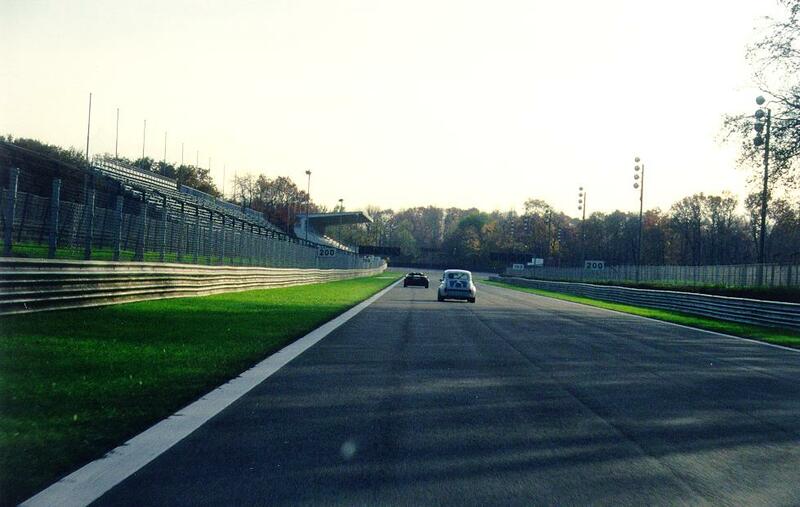 The variante is a sharp right-left sequence which leads into a short straightaway (rettifilo) that leads to the famous Curva Grande. 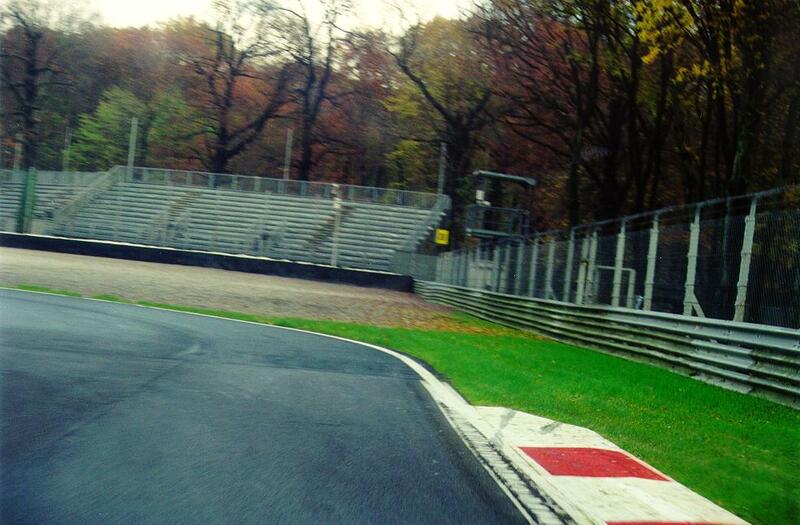 This is a wide sweeping right hander that the Formula 1 cars take without lifting. I was able to keep the accelerator floored as well, but this wasn't much of a big deal since the little Mercedes was definitely horsepower-limited. 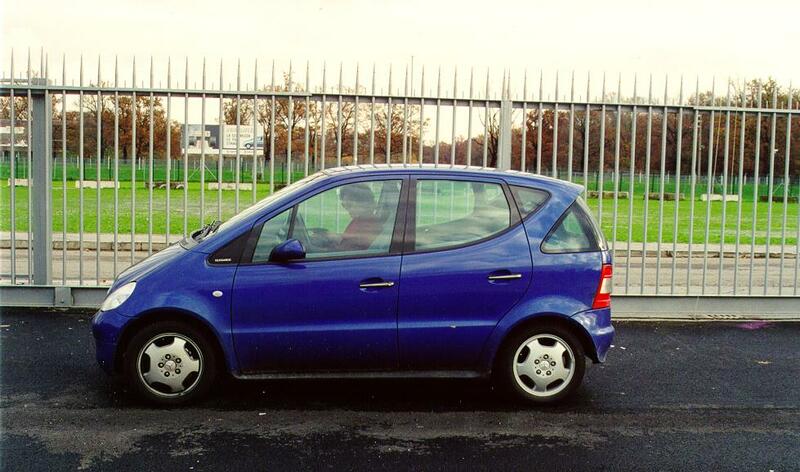 Although underpowered, the little Deutche Wagen handled and braked remarkably well. 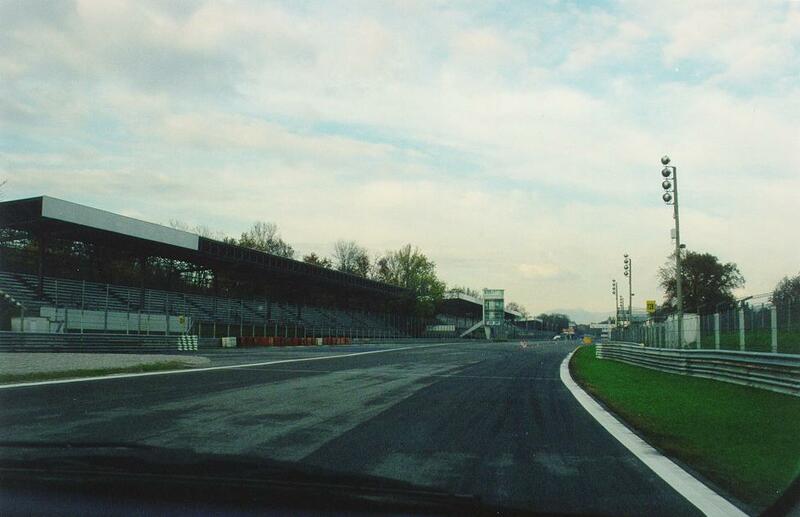 After exiting the Curva Grande there is a medium length straight section leading to the Variante Della Roggia, for me the absolute worst corner on the entire circuit. It is a wicked 90 degree lefthander followed by an immediate 80 degree righthander. Fortunately there is a runoff strip between the two. I had to use it on the first lap because I waited until way too late to brake and the car understeered badly. This was my fault, not the car. I made a mental note to brake earlier on the next lap. 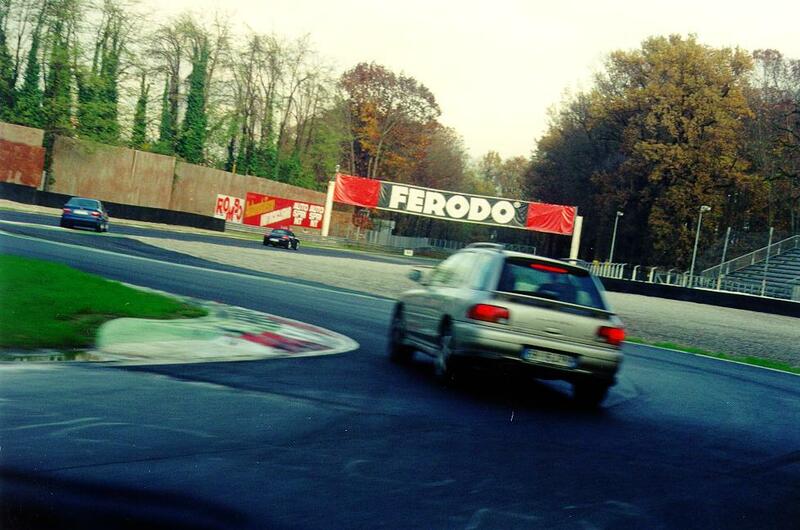 Another short straight section leads to Prima Curva Di Lesmo, or first Lesmo, named after a nearby village. This is a gentle 90 degree righthander and I was surprised at how much speed I could carry through it in the little Mercedes. 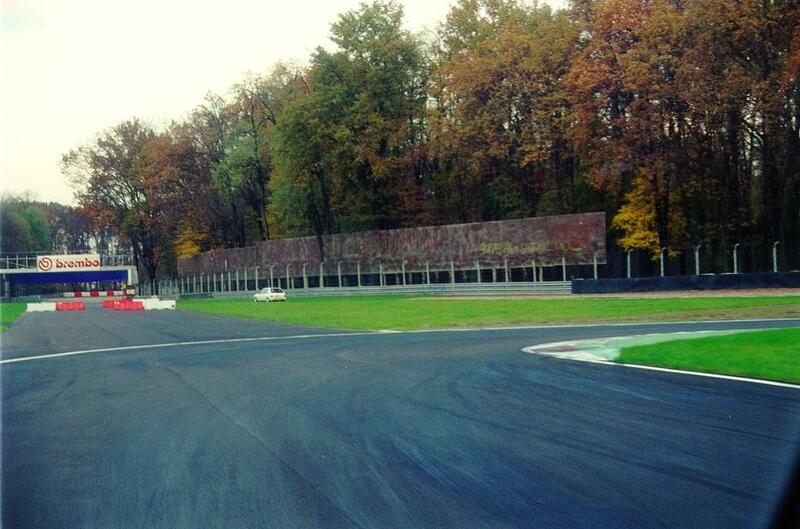 Another short straight leads to the Curva Seconda Di Lesmos, the second Lesmo corner. 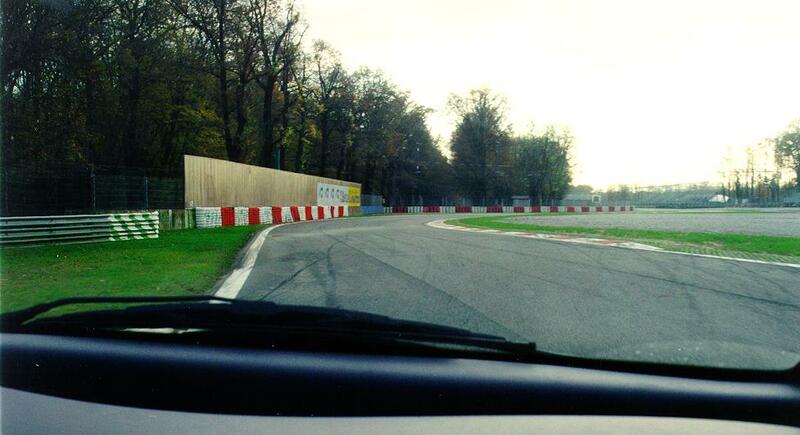 This is an 80 degree righthander leading to a long straight with a kink in the middle called Curva Del Serraglio (literally "Zoo corner" for the nearby zoo). 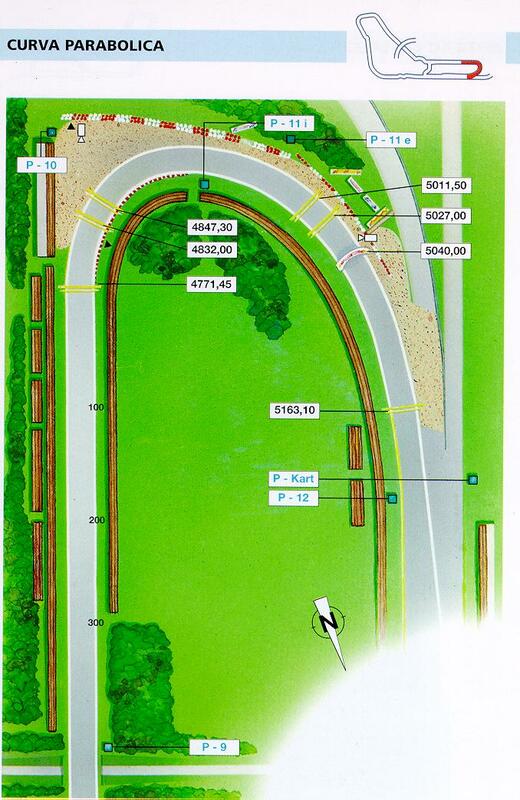 This stretch takes you under the bridge that carries the old banked-oval portion of the track which was used in the 1950's. 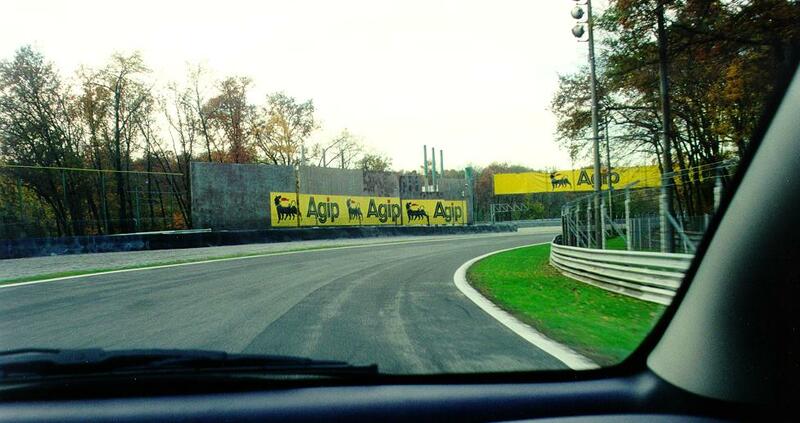 After the bridge you approach the braking area for the famous Variante Ascari, named for Alberto Ascari, a legend in Grand Prix racing. 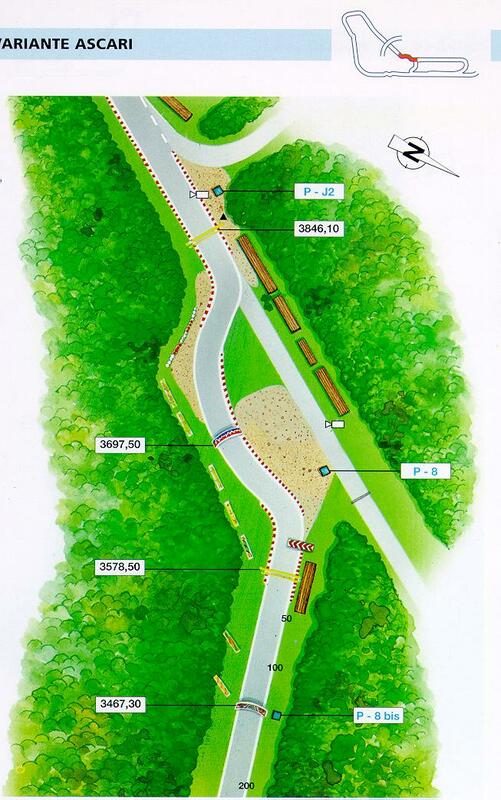 The Variante Ascari was by far my favorite corner on the entire course. It starts with a sharp left hander, followed by a sweeping right hander, and ends with another left hander. I was able to get the little Mercedes into a perfect four-wheel drift almost everytime I went though this corner and it was a most exhilerating experience. 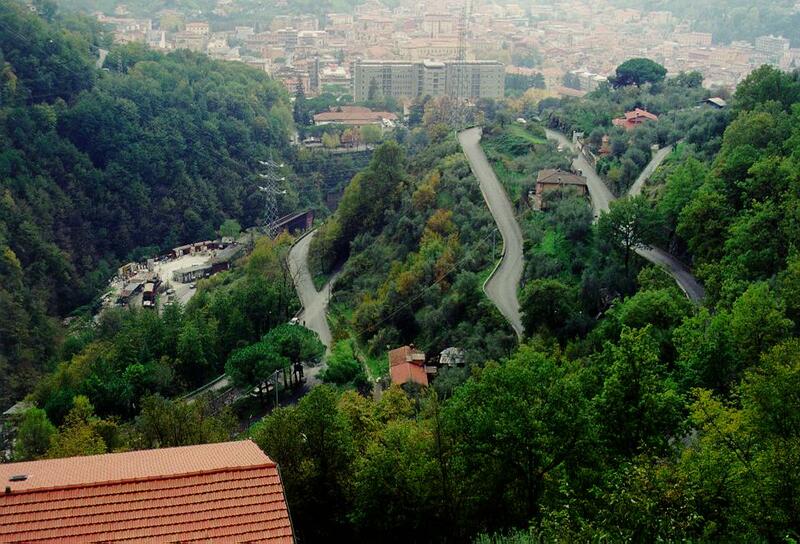 The Rettifilo Centrale is next, the second longest straight on the circuit. 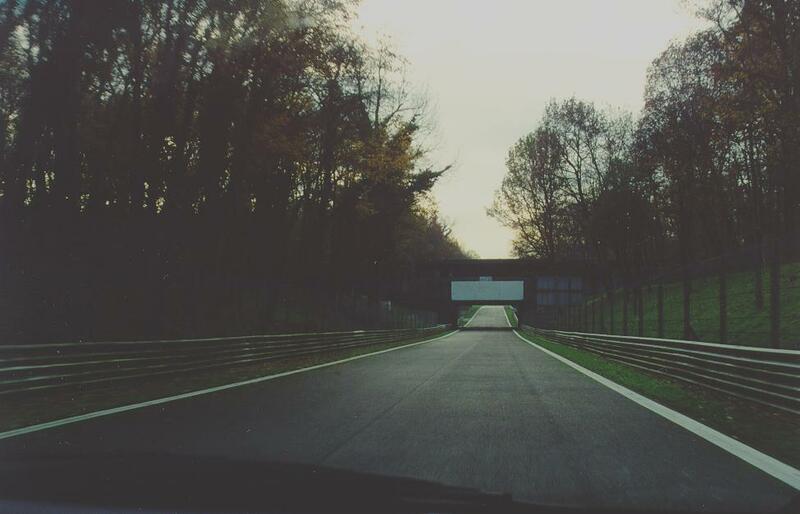 I was able to get the Mercedes up to 100MPH on this stretch before having to brake for the last turn, Curva Parabolica. 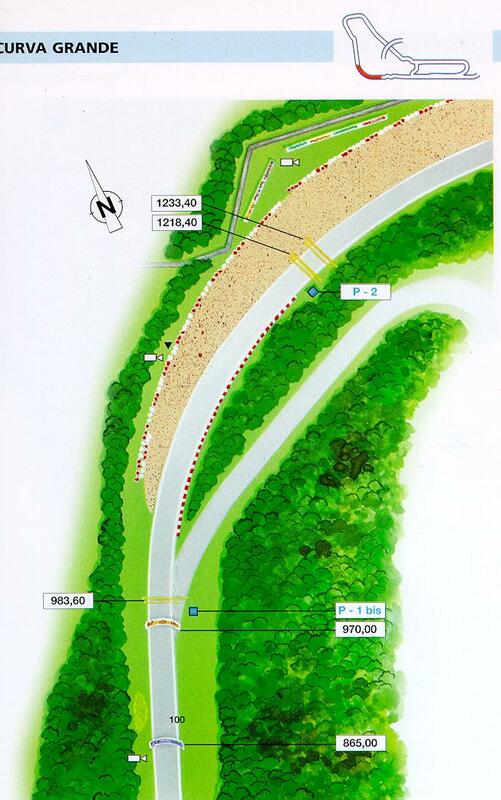 The Curva Parabolica is an increasing radius corner. 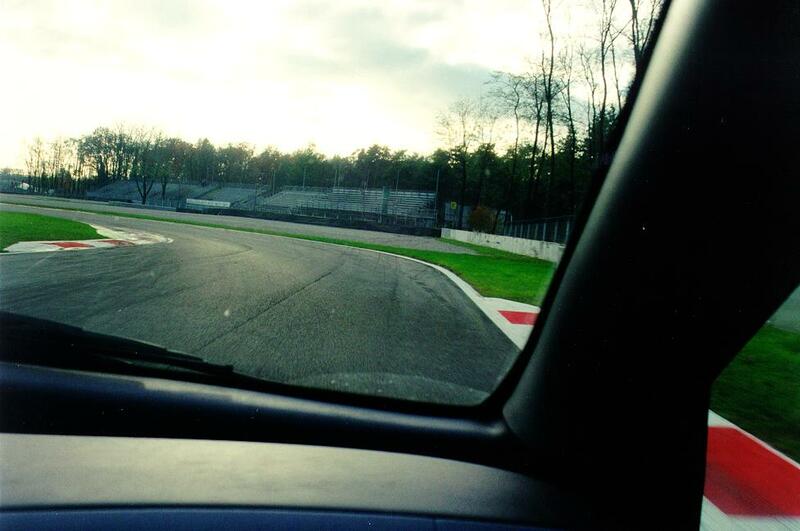 In a more powerful car this corner would be very challenging, but in the A160 I could floor it as soon as I cleared the apex and keep my foot buried all the way down the front straight, or Rettifilo Tribune (literally "Grandstand straight"). 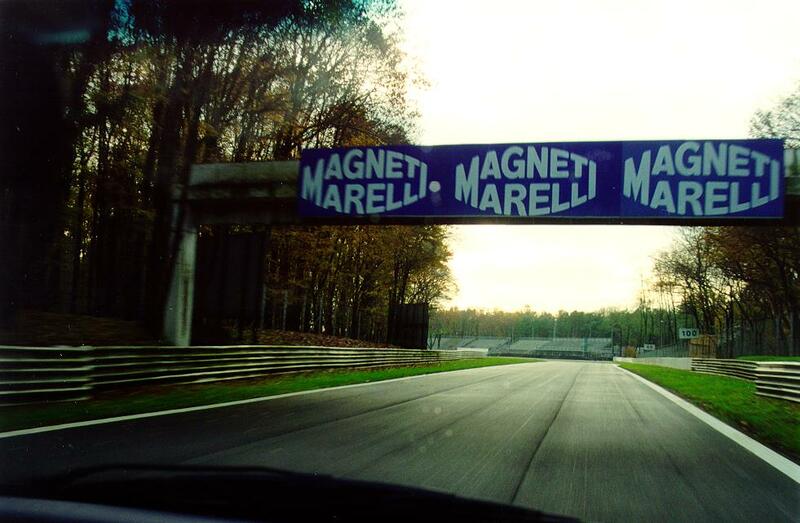 I was able to get the Mercedes up to a fairly respectable 110MPH on this straight before having to brake heavily for the Variante Del Rettifilo chicane. 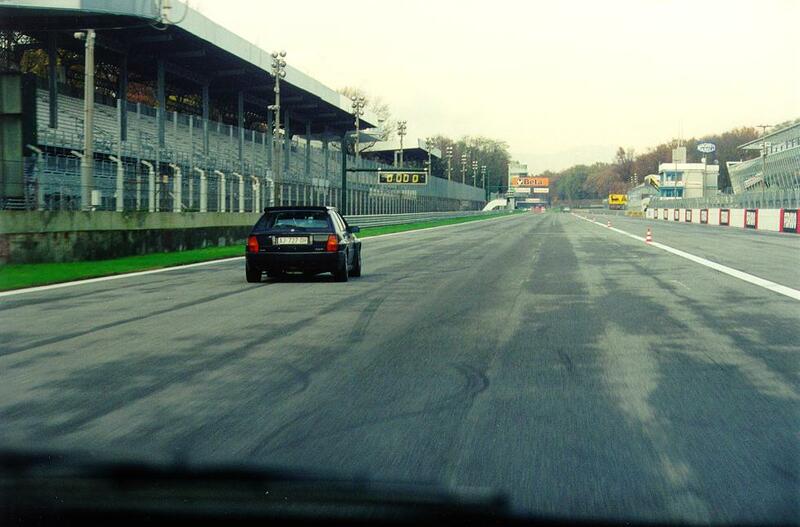 For the first few laps around the circuit we were alone on the track. 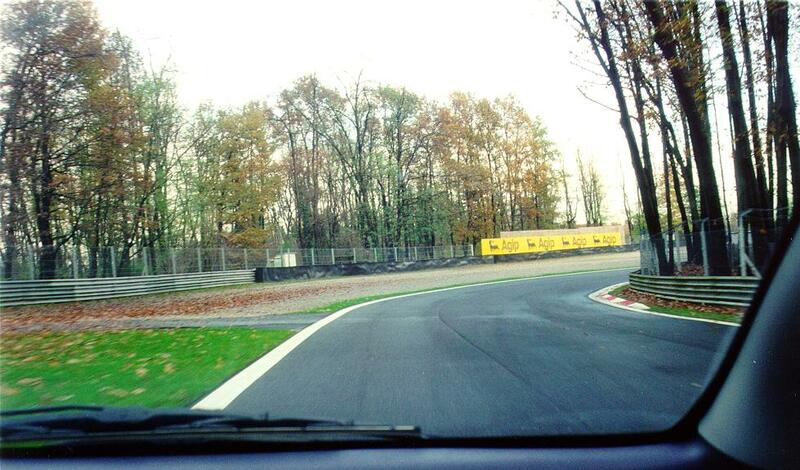 But gradually other cars began to enter the circuit. Most of the drivers in these cars were doing what I was doing, that is driving as fast as my ability and the car would allow. A few however decided to take a more leisurely tour around the course and overtaking them was an adventure since I could not tell if they saw me in their mirrors or not. Some possessed very good situational awareness and waved me by, but others were so oblivious to the rules of overtaking that I had to be very careful when passing them. 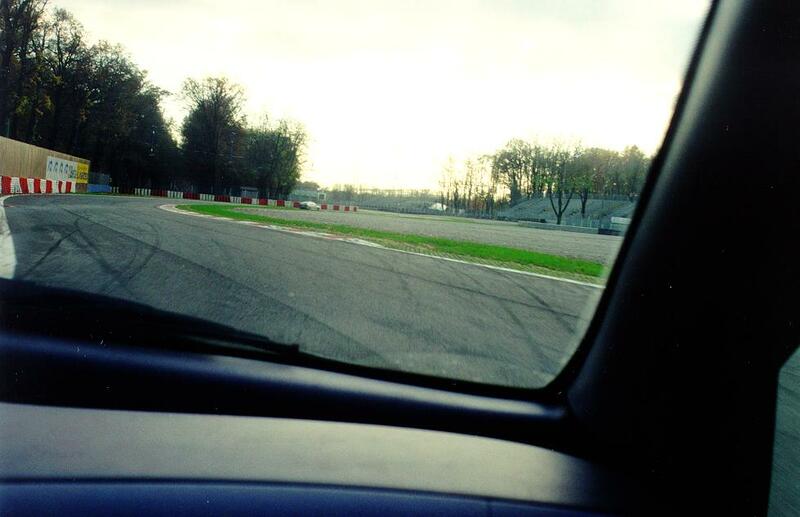 There were some drivers who could lap faster than we could and I always moved off the racing line, gave them plenty of room, and waved them by. Most cheerfully waved their enthusiastic "grazzi" in return. 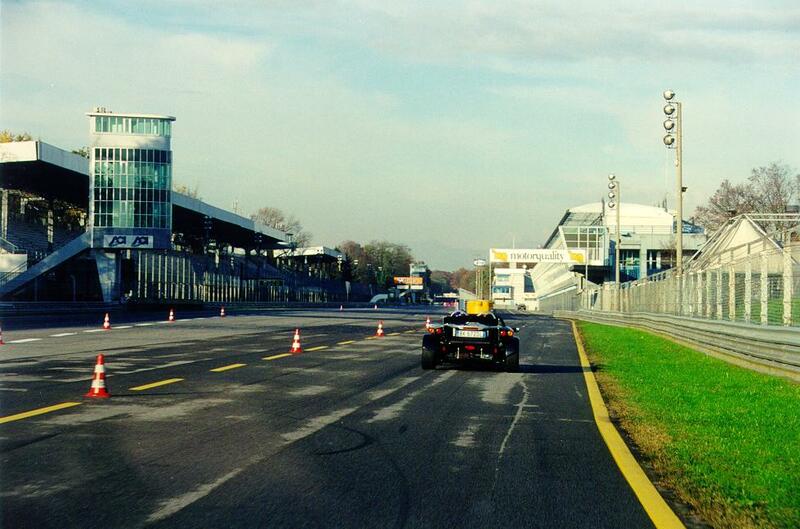 We managed to get into a spirited dice with a Porcshe Boxster and a BMW M-3 for about three laps. 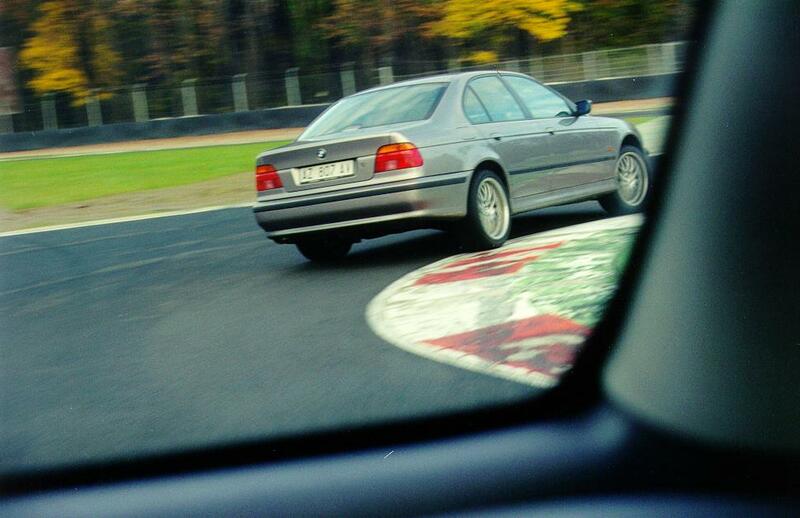 Their cars had more power than mine, and they certainly handled better, but my autocrossing and brief amateur road racing experience allowed me to brake later, apex later, and in general make up in the corners what I lost in the straights. We actually started lapping other traffic as a group and this became very dicey indeed. 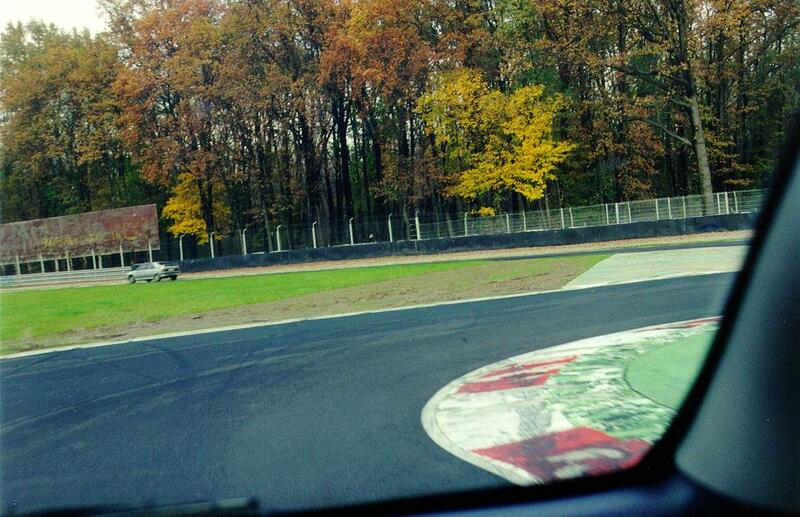 Below are photos my wife shot from the passemger seat while I hot-lapped the circuit. 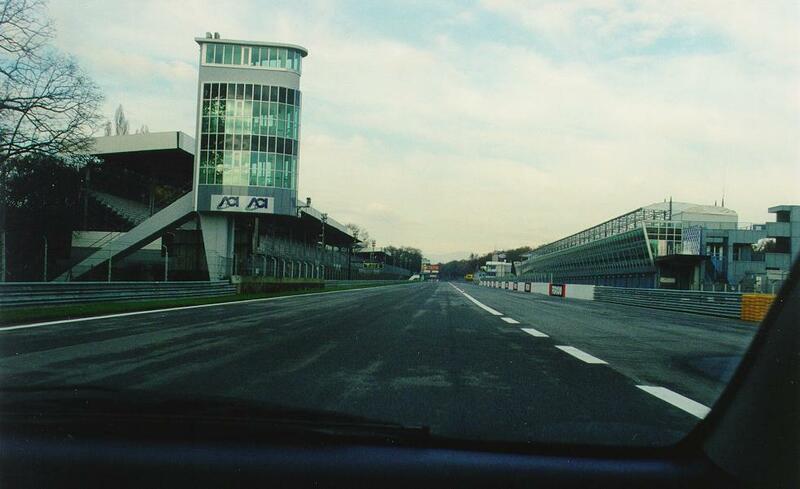 Pit straight, end of first lap. 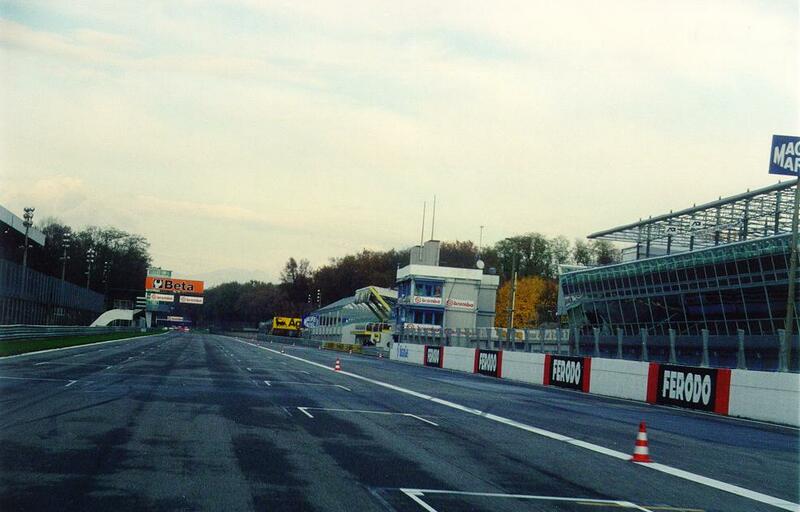 Pit straight with pit entrance visible on right. 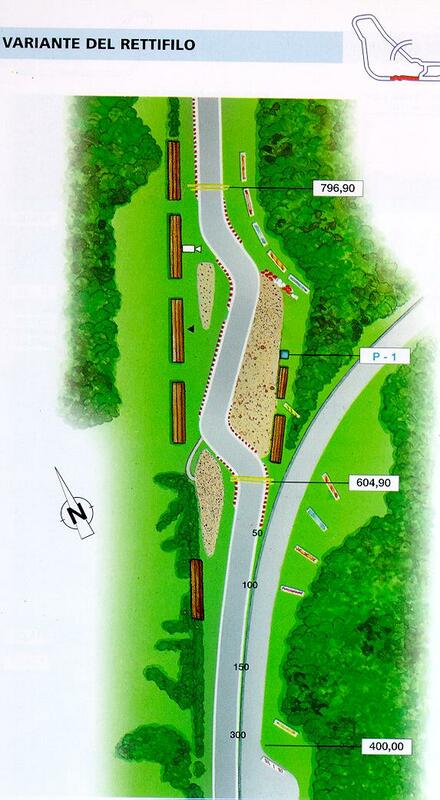 The following images are plan views of each corner of the circuit. 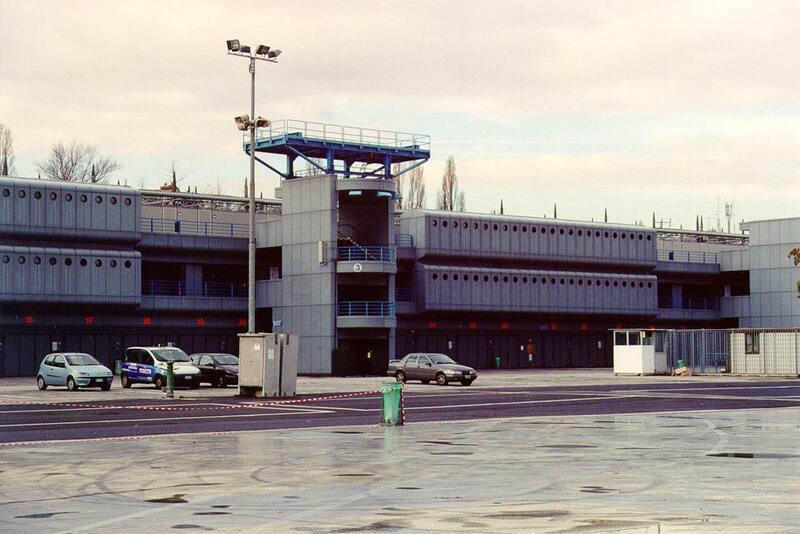 Since our flight left rather early we decided to drive to Gallarate and spend the night at the Jet Hotel in order to assure that we would get to the airport with enough time to return the rental car, clear passport control, and check-in at the Alitalia gate. 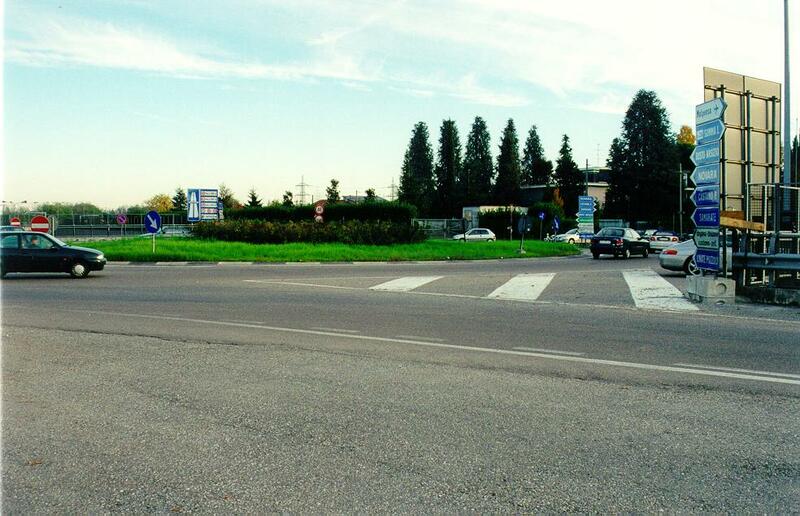 Traffic circle near Malpensa. These are as close as you can come to the excitment of a Formula 1 race since no one yields an inch, ever. 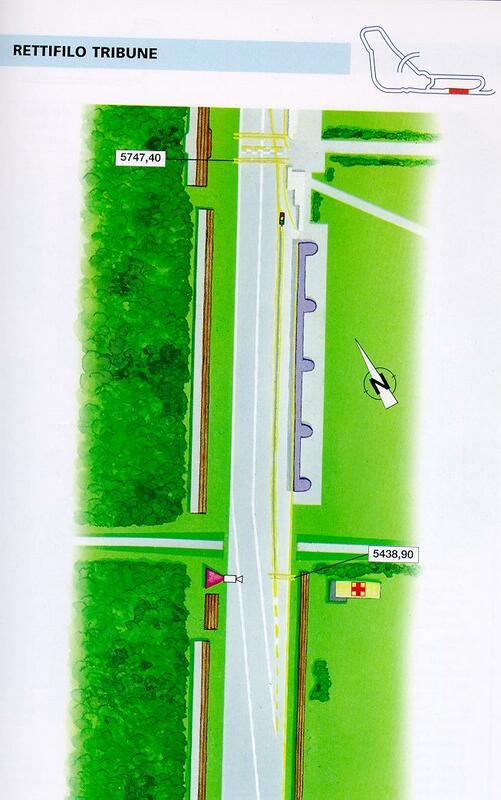 Practice your merging skills before attempting to negotiate these. 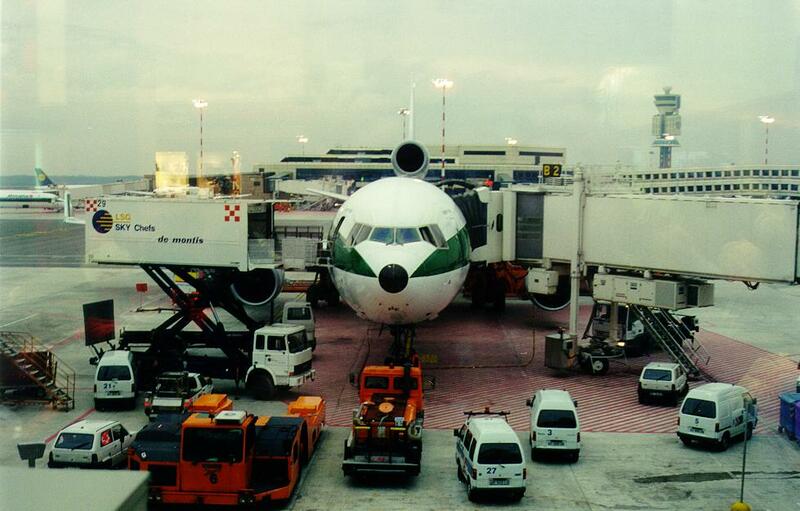 Alitalia MD-11 at Malpensa. This is an MD-11 "Combo", meaning only half (the front) of the passemger compartment is utilized for passengers. The remainder is devoted to cargo. It made for fast ingress and egress since there were not that many passengers, despite the fact that every seat was occupied. 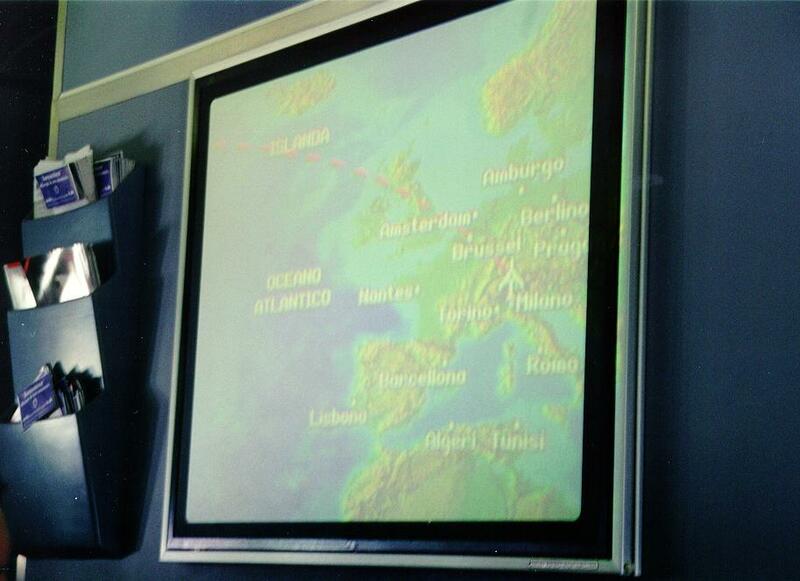 We departed from Malpensa airport on November 21, 2000 at 9AM. The flight home was a very tedious but uneventful 12 1/2 hours to LAX. Photos are copyright ©Ray Smith, all rights reserved, and may not be reproduced without express written permission.